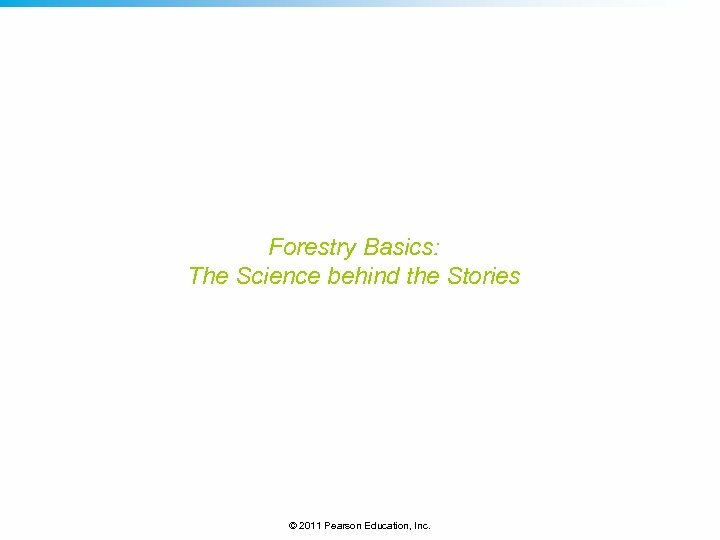 Forestry Basics: The Science behind the Stories © 2011 Pearson Education, Inc. 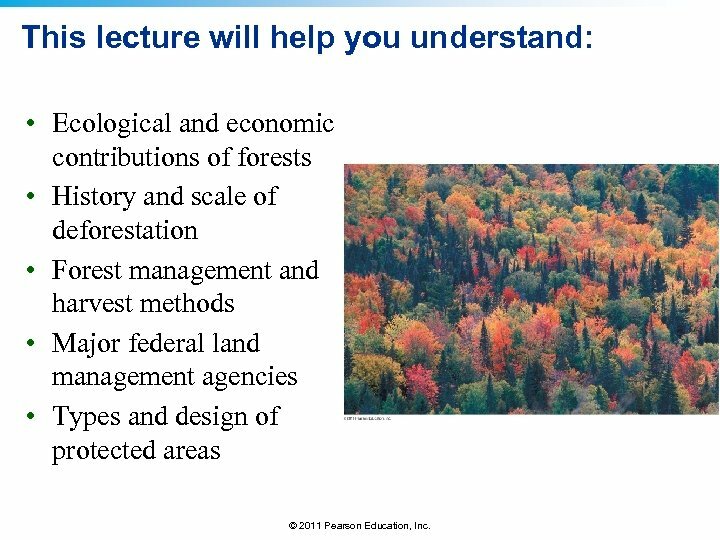 This lecture will help you understand: • Ecological and economic contributions of forests • History and scale of deforestation • Forest management and harvest methods • Major federal land management agencies • Types and design of protected areas © 2011 Pearson Education, Inc.
Central Case: Certified sustainable paper • The paper in this book is made from trees sustainably grown, managed, harvested, and processed - This does not deplete mature trees or degrade ecological functions - The mill recycles chemicals and paper and burns discarded lignin to help provide power This paper is Forest Stewardship Council (FSC)certified from sources that use sustainable practices © 2011 Pearson Education, Inc. 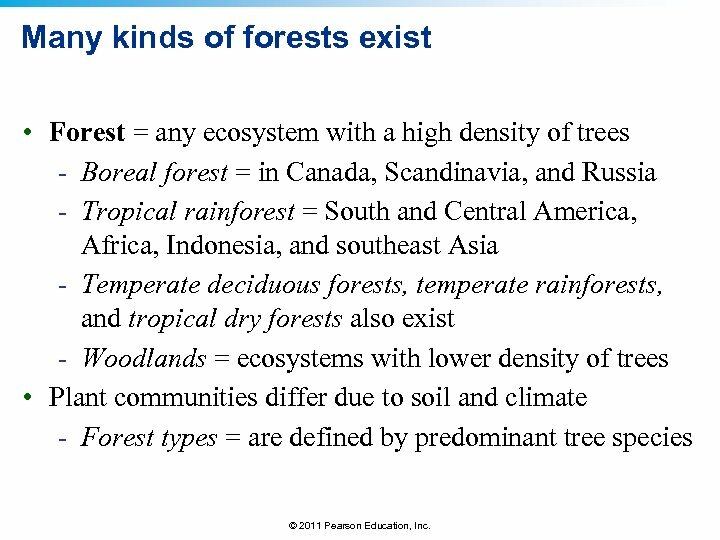 Many kinds of forests exist • Forest = any ecosystem with a high density of trees - Boreal forest = in Canada, Scandinavia, and Russia - Tropical rainforest = South and Central America, Africa, Indonesia, and southeast Asia - Temperate deciduous forests, temperate rainforests, and tropical dry forests also exist - Woodlands = ecosystems with lower density of trees • Plant communities differ due to soil and climate - Forest types = are defined by predominant tree species © 2011 Pearson Education, Inc.
Forests cover 31% of Earth’s surface © 2011 Pearson Education, Inc.
Forest types • The Eastern U. S. has 10 forest types - Spruce-fir, oakhickory, longleaf-slash pine • The Western U. S. holds 13 forest types - Douglas fir, ponderosa pine, pinyon-juniper woodlands © 2011 Pearson Education, Inc.
Forests are ecologically complex • Forests are some of the richest ecosystems for biodiversity - They are structurally complex, with many niches - They provide food and shelter for multitudes of species - Fungi and microbes have parasitic and mutualistic relationships with plants • Plant diversity leads to greater overall organism diversity - Succession changes species composition • Old-growth forest diversity exceeds that of young forests - They have higher structural diversity, habitats, and resources © 2011 Pearson Education, Inc.
A cross-section of a mature forest The scarlet tanager lives in the eastern U. S. temperate deciduous forest © 2011 Pearson Education, Inc.
Forests provide ecosystem services • Forests provide cultural, aesthetic, health, and recreation values • Forests also provide vital ecosystem services - Stabilize soil and prevent erosion - Slow runoff, prevent flooding, purify water - Store carbon, release oxygen, influence weather patterns, and moderate climate • Roots draw minerals to surface soil layers - Plants return organic material to the topsoil as litter © 2011 Pearson Education, Inc. 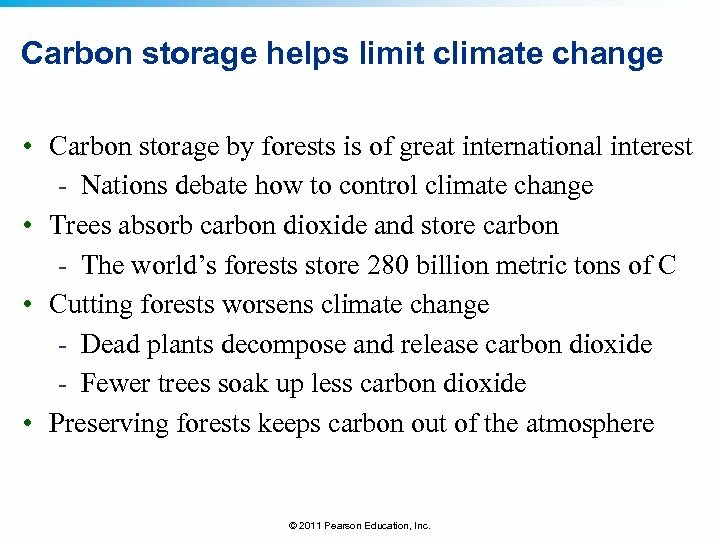 Carbon storage helps limit climate change • Carbon storage by forests is of great international interest - Nations debate how to control climate change • Trees absorb carbon dioxide and store carbon - The world’s forests store 280 billion metric tons of C • Cutting forests worsens climate change - Dead plants decompose and release carbon dioxide - Fewer trees soak up less carbon dioxide • Preserving forests keeps carbon out of the atmosphere © 2011 Pearson Education, Inc.
Forests provide us valuable resources • Benefits: medicines, food, fuel, shelter, ships, paper • Help us achieve a high standard of living • Logging locations: - Boreal forests: Canada, Russia - Rainforests: Brazil, Indonesia - Conifer forests/pine plantations: U. S. In 2010, 30% of all forests were designated for timber production © 2011 Pearson Education, Inc.
Demand for wood leads to deforestation • Deforestation = the clearing and loss of forests - Changes landscapes and ecosystems - Reduces biodiversity - Worsens climate change - Disrupts ecosystem services - Ruins civilizations Although the rate of deforestation is slowing, we still lose 12. 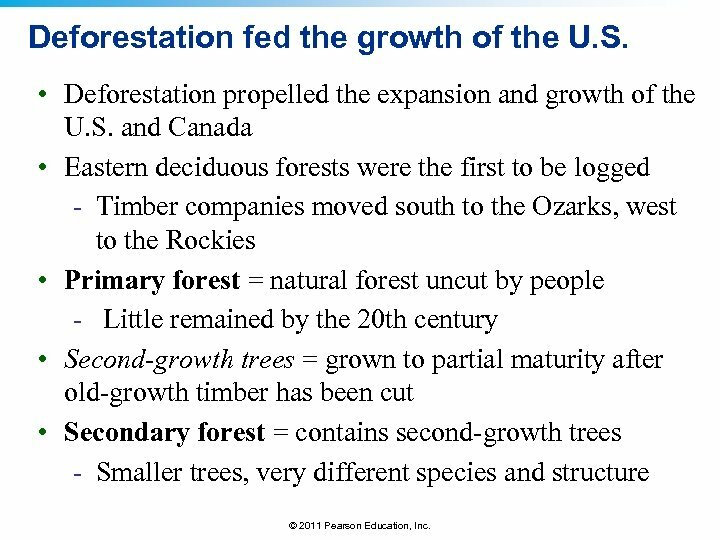 8 million acres/year © 2011 Pearson Education, Inc.
Deforestation fed the growth of the U. S. • Deforestation propelled the expansion and growth of the U. S. and Canada • Eastern deciduous forests were the first to be logged - Timber companies moved south to the Ozarks, west to the Rockies • Primary forest = natural forest uncut by people - Little remained by the 20 th century • Second-growth trees = grown to partial maturity after old-growth timber has been cut • Secondary forest = contains second-growth trees - Smaller trees, very different species and structure © 2011 Pearson Education, Inc. 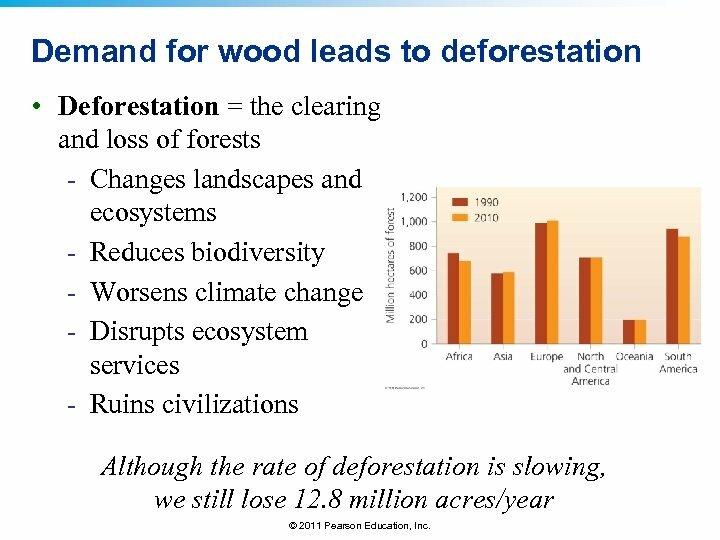 Most primary forest is gone The entire eastern half of the continent used to be covered in primary forest Most primary forest was cut for agriculture and timber © 2011 Pearson Education, Inc.
Loggers lose their jobs with deforestation • As each region is deforested, the timber industry declines and timber companies move on - Local loggers lose their jobs • Once the remaining ancient trees of North America are gone, loggers will once again lose jobs - Companies will simply move to another area - Most move to developing countries © 2011 Pearson Education, Inc. 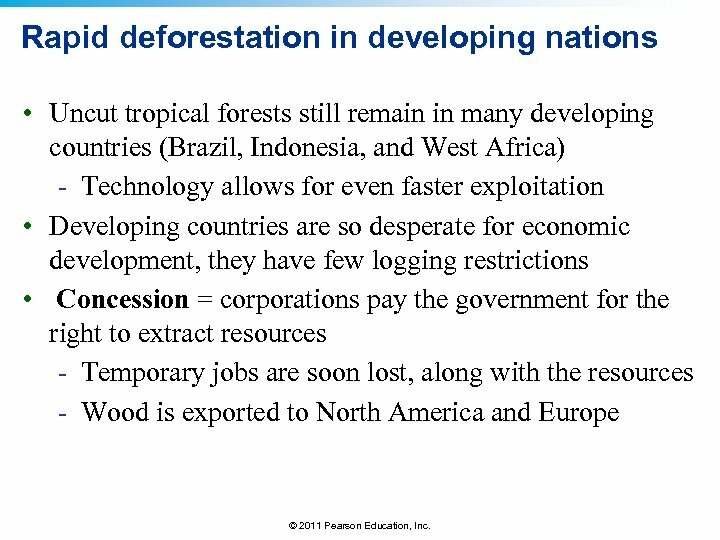 Rapid deforestation in developing nations • Uncut tropical forests still remain in many developing countries (Brazil, Indonesia, and West Africa) - Technology allows for even faster exploitation • Developing countries are so desperate for economic development, they have few logging restrictions • Concession = corporations pay the government for the right to extract resources - Temporary jobs are soon lost, along with the resources - Wood is exported to North America and Europe © 2011 Pearson Education, Inc.
Deforestation affects people • In Malaysia, foreign corporations have deforested millions of acres of tropical rainforest - Affecting 22 tribes of hunter-gatherers - The government did not consult the tribes • Deforestation decreased game - Oil palm agriculture’s pesticides and fertilizers killed fish • The people peacefully protested - The government wants to convert tribes to farmers © 2011 Pearson Education, Inc.
Palm oil plantations • Palm oil is used in snack foods, soaps, cosmetics, biofuel • Borneo has lost most of its forest cover • Clearing encourages further development and illegal logging © 2011 Pearson Education, Inc. 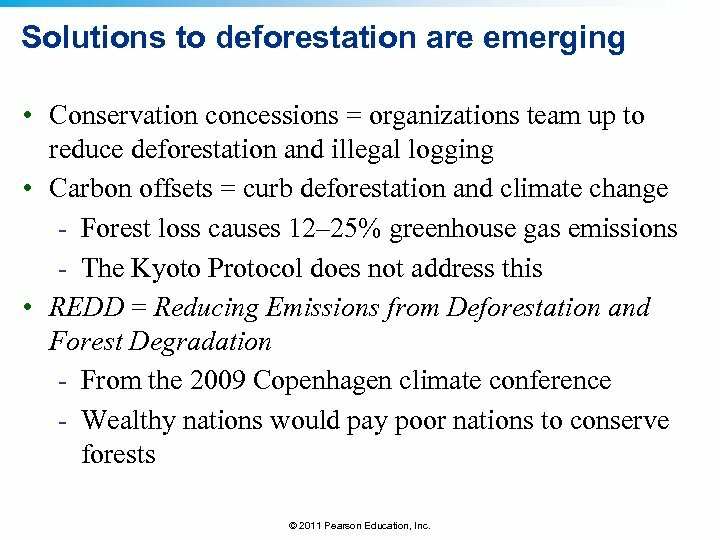 Solutions to deforestation are emerging • Conservation concessions = organizations team up to reduce deforestation and illegal logging • Carbon offsets = curb deforestation and climate change - Forest loss causes 12– 25% greenhouse gas emissions - The Kyoto Protocol does not address this • REDD = Reducing Emissions from Deforestation and Forest Degradation - From the 2009 Copenhagen climate conference - Wealthy nations would pay poor nations to conserve forests © 2011 Pearson Education, Inc.
REDD • The Copenhagen conference ended without a binding agreement - The REDD plan fell through - But some of the $100 billion/year going to poor nations may go to REDD • Guyana is taking a leading role in REDD - It is poor financially but rich in forests - Cutting forests would provide $580 million/year - Norway will pay $20 million in 2010 for conservation and up to $250 million in 2015 © 2011 Pearson Education, Inc.
Forest management • Forestry (silviculture) = forest management - Sustainable forest management is spreading • Foresters = professional managers who must balance demand forest products (short-term benefits) vs. the importance of forests as ecosystems (long term) • Resource management = strategies to manage and regulate potentially renewable resources - Sustainable management does not deplete resources - Managers are influenced by social, political, and economic factors © 2011 Pearson Education, Inc. 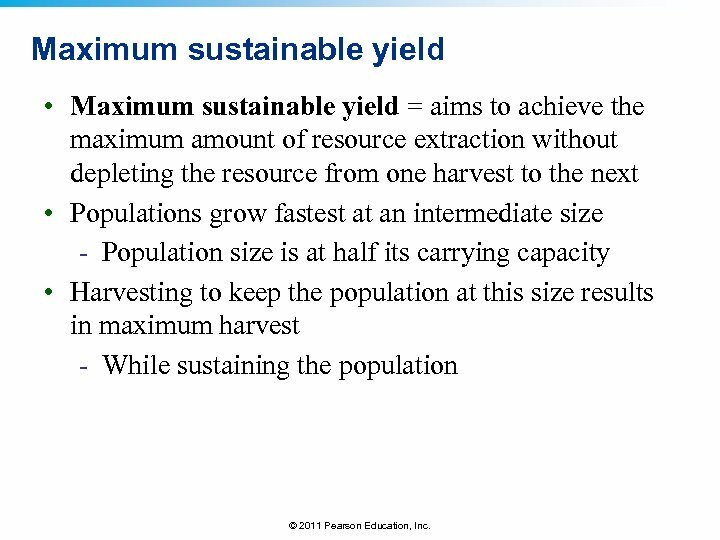 Maximum sustainable yield • Maximum sustainable yield = aims to achieve the maximum amount of resource extraction without depleting the resource from one harvest to the next • Populations grow fastest at an intermediate size - Population size is at half its carrying capacity • Harvesting to keep the population at this size results in maximum harvest - While sustaining the population © 2011 Pearson Education, Inc. 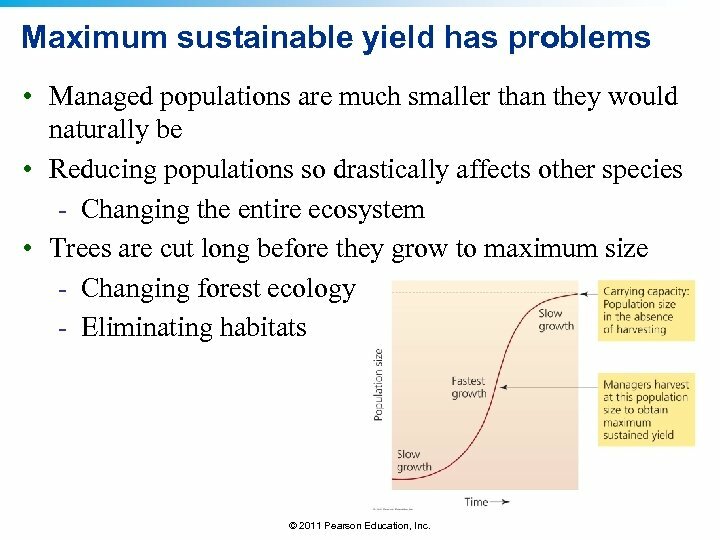 Maximum sustainable yield has problems • Managed populations are much smaller than they would naturally be • Reducing populations so drastically affects other species - Changing the entire ecosystem • Trees are cut long before they grow to maximum size - Changing forest ecology - Eliminating habitats © 2011 Pearson Education, Inc.
Ecosystem-based management • Ecosystem-based management = managing resource harvesting to minimize impacts on ecosystems and ecological processes • Sustainably certified forestry plans protect areas - Restore ecologically important habitats - Consider patterns at the landscape level - Preserve the forest’s functional integrity • It is challenging to implement this type of management - Ecosystems are complex - Our understanding of how they operate is limited © 2011 Pearson Education, Inc.
Adaptive management • Adaptive management = testing different approaches and aiming to improve methods through time - Monitoring results and adjusting methods as needed - Time-consuming and complicated, but effective • The 1994 Northwest Forest Plan resolved disputes between loggers and preservationists over the last U. S. old-growth temperate rainforests - The plan let science guide management - It allowed limited logging while protecting species and ecosystems © 2011 Pearson Education, Inc. 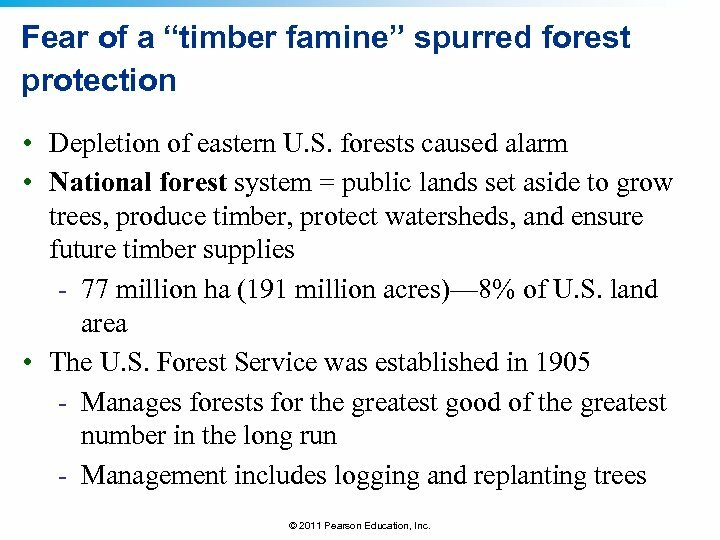 Fear of a “timber famine” spurred forest protection • Depletion of eastern U. S. forests caused alarm • National forest system = public lands set aside to grow trees, produce timber, protect watersheds, and ensure future timber supplies - 77 million ha (191 million acres)— 8% of U. S. land area • The U. S. Forest Service was established in 1905 - Manages forests for the greatest good of the greatest number in the long run - Management includes logging and replanting trees © 2011 Pearson Education, Inc.
Federal agencies own land in the U. S. © 2011 Pearson Education, Inc. 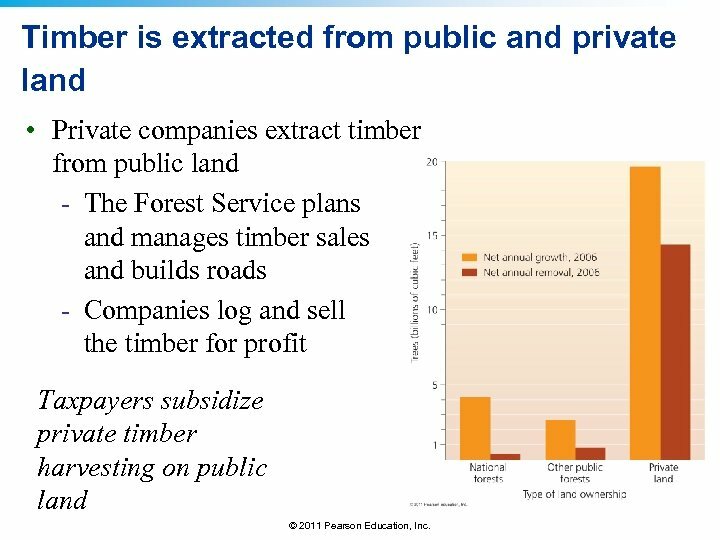 Timber is extracted from public and private land • Private companies extract timber from public land - The Forest Service plans and manages timber sales and builds roads - Companies log and sell the timber for profit Taxpayers subsidize private timber harvesting on public land © 2011 Pearson Education, Inc.
Logging on private vs. public land • Most U. S. logging occurs on private land owned by timber companies or small landowners - Companies use the maximum sustained yield approach • Management on public lands reflects social and political factors that change over time - Public concern, changing management philosophies, and economics have caused harvests to decrease - But the secondary forests that replace primary forests are less ecologically valuable © 2011 Pearson Education, Inc.
Plantation forestry • The timber industry focuses on timber plantations - Fast-growing, single-species monocultures • Even-aged stands= all trees are the same age • Rotation time = trees are cut after a certain time - The land is replanted • Uneven-aged stands = mixed ages of trees and species Tree plantations are crops, not ecologically functional forests © 2011 Pearson Education, Inc. 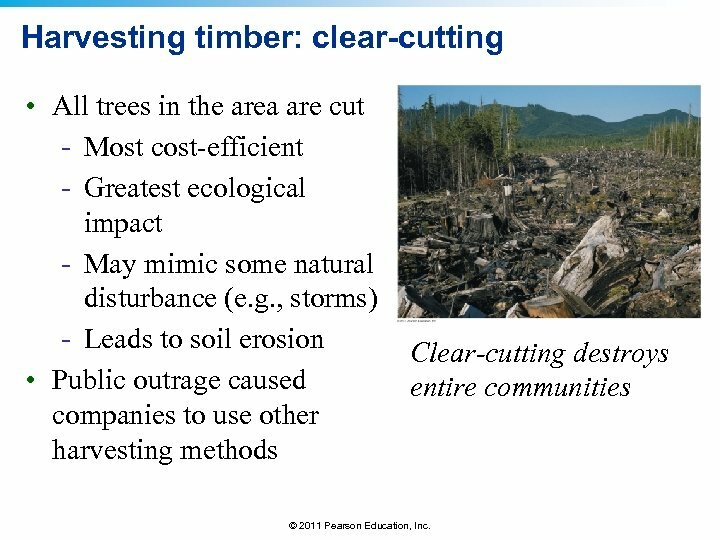 Harvesting timber: clear-cutting • All trees in the area are cut - Most cost-efficient - Greatest ecological impact - May mimic some natural disturbance (e. g. , storms) - Leads to soil erosion • Public outrage caused companies to use other harvesting methods Clear-cutting destroys entire communities © 2011 Pearson Education, Inc. 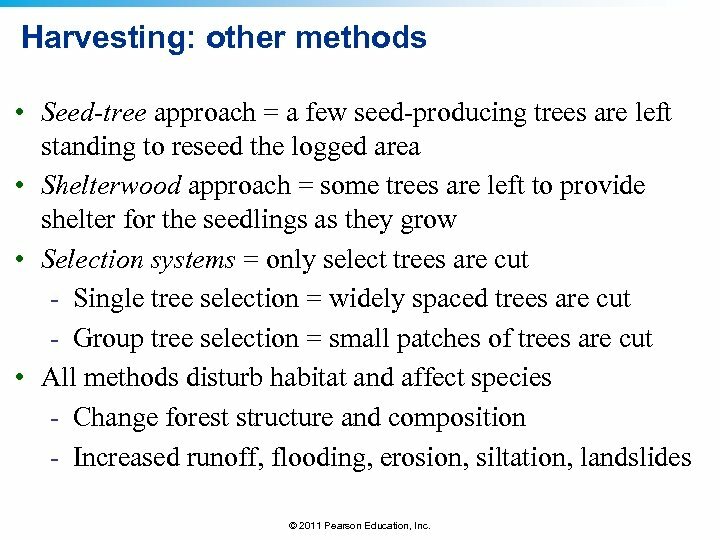 Harvesting: other methods • Seed-tree approach = a few seed-producing trees are left standing to reseed the logged area • Shelterwood approach = some trees are left to provide shelter for the seedlings as they grow • Selection systems = only select trees are cut - Single tree selection = widely spaced trees are cut - Group tree selection = small patches of trees are cut • All methods disturb habitat and affect species - Change forest structure and composition - Increased runoff, flooding, erosion, siltation, landslides © 2011 Pearson Education, Inc. 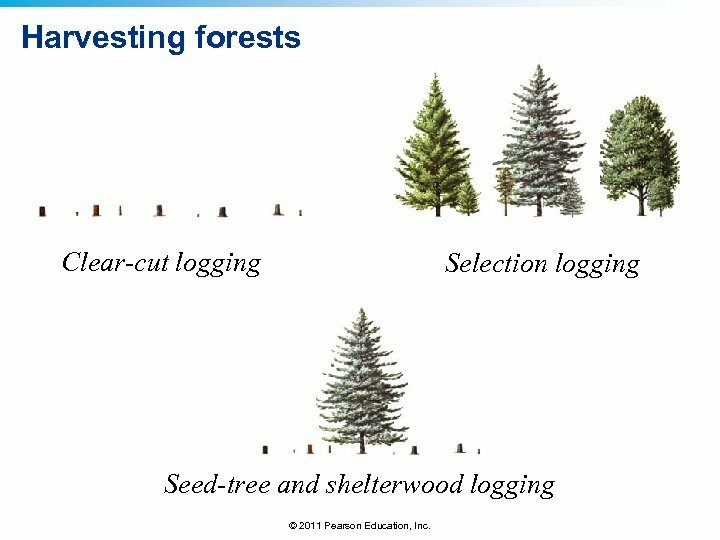 Harvesting forests Clear-cut logging Selection logging Seed-tree and shelterwood logging © 2011 Pearson Education, Inc. 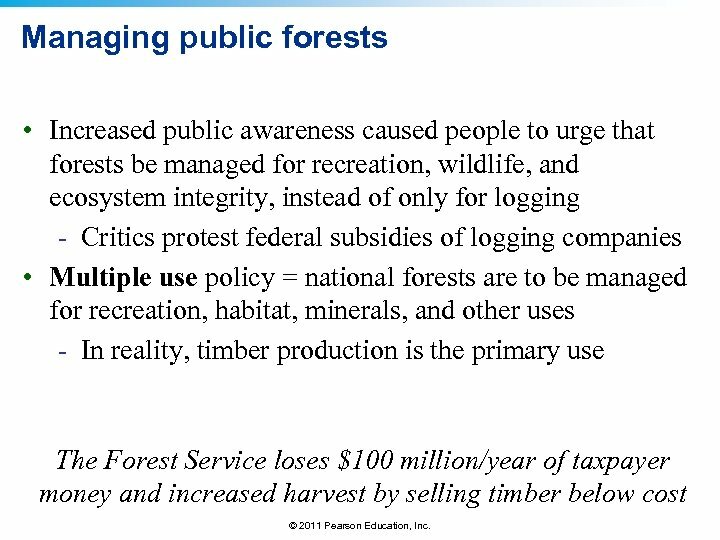 Managing public forests • Increased public awareness caused people to urge that forests be managed for recreation, wildlife, and ecosystem integrity, instead of only for logging - Critics protest federal subsidies of logging companies • Multiple use policy = national forests are to be managed for recreation, habitat, minerals, and other uses - In reality, timber production is the primary use The Forest Service loses $100 million/year of taxpayer money and increased harvest by selling timber below cost © 2011 Pearson Education, Inc. 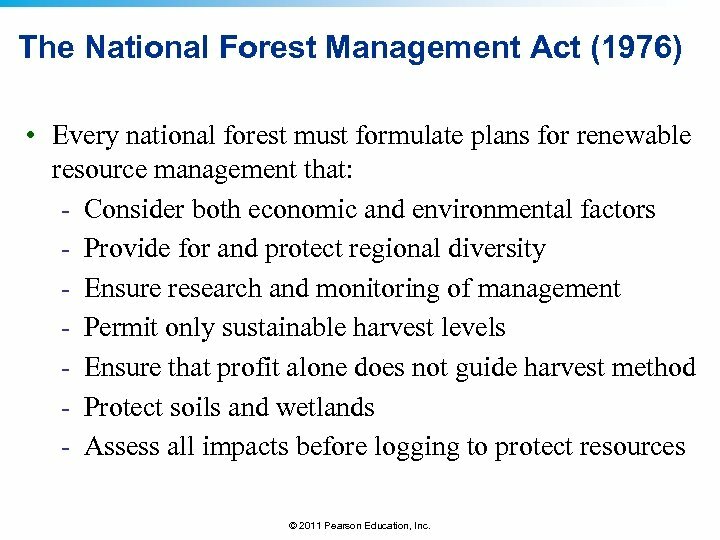 The National Forest Management Act (1976) • Every national forest must formulate plans for renewable resource management that: - Consider both economic and environmental factors - Provide for and protect regional diversity - Ensure research and monitoring of management - Permit only sustainable harvest levels - Ensure that profit alone does not guide harvest method - Protect soils and wetlands - Assess all impacts before logging to protect resources © 2011 Pearson Education, Inc.
New forestry • U. S. Forest Service programs: - Manage wildlife, non-game animals, endangered species - Push for ecosystem-based management - Run programs for ecological restoration • New forestry = timber cuts that mimic natural events - Sloppy clear-cuts mimic windstorms © 2011 Pearson Education, Inc. 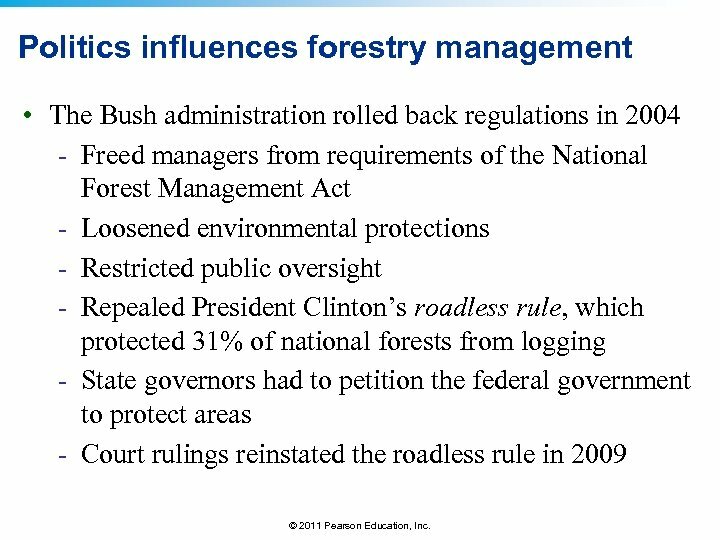 Politics influences forestry management • The Bush administration rolled back regulations in 2004 - Freed managers from requirements of the National Forest Management Act - Loosened environmental protections - Restricted public oversight - Repealed President Clinton’s roadless rule, which protected 31% of national forests from logging - State governors had to petition the federal government to protect areas - Court rulings reinstated the roadless rule in 2009 © 2011 Pearson Education, Inc.
Fire policy also stirs controversy • For over 100 years, the Forest Service suppressed all fires - But many ecosystems depend on fires - Excess vegetation produces kindling for future fires • In the wildland-urban interface, housing developments that are near forests are vulnerable to forest fires Catastrophic fires have become more numerous recently © 2011 Pearson Education, Inc. 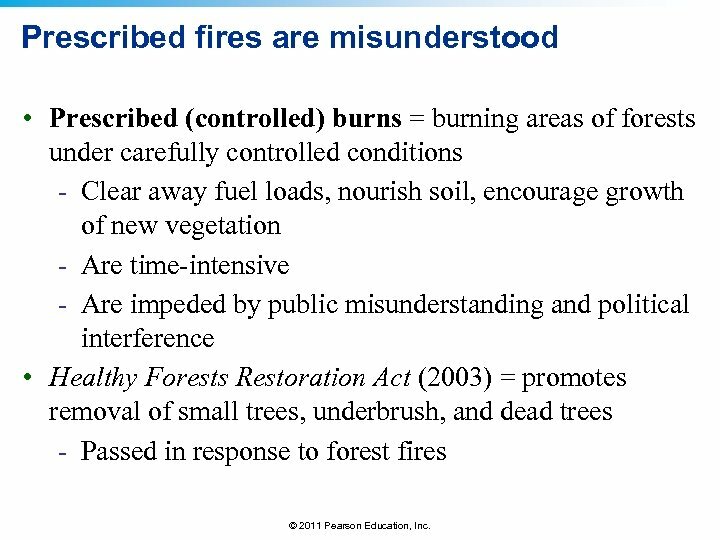 Prescribed fires are misunderstood • Prescribed (controlled) burns = burning areas of forests under carefully controlled conditions - Clear away fuel loads, nourish soil, encourage growth of new vegetation - Are time-intensive - Are impeded by public misunderstanding and political interference • Healthy Forests Restoration Act (2003) = promotes removal of small trees, underbrush, and dead trees - Passed in response to forest fires © 2011 Pearson Education, Inc.
Salvage logging • Removal of dead trees following a natural disturbance • It seems logical, but is really destructive - Snags (standing dead trees) provide nesting and roosting cavities for countless animals - Removing timber from recently burned areas increases erosion and soil damage - Impedes forest regeneration and promotes future fires © 2011 Pearson Education, Inc. 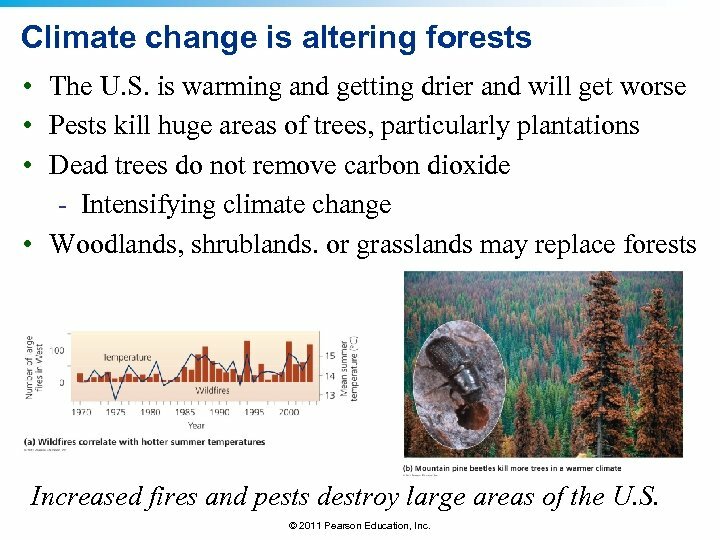 Climate change is altering forests • The U. S. is warming and getting drier and will get worse • Pests kill huge areas of trees, particularly plantations • Dead trees do not remove carbon dioxide - Intensifying climate change • Woodlands, shrublands. 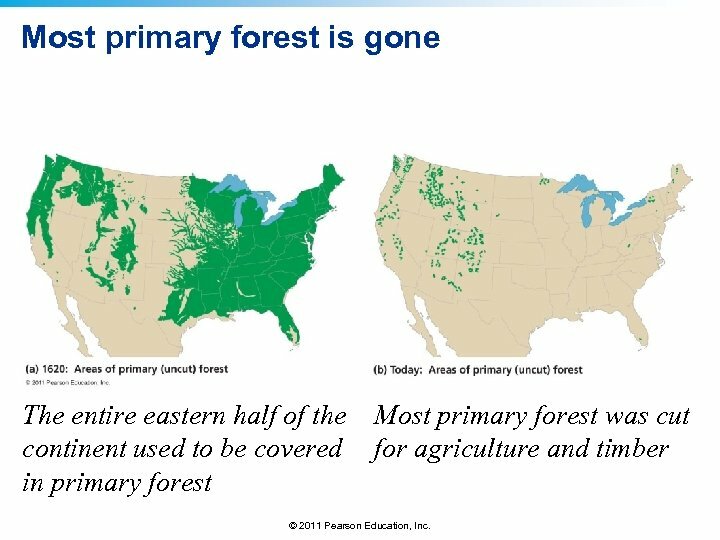 or grasslands may replace forests Increased fires and pests destroy large areas of the U. S. © 2011 Pearson Education, Inc.
Progress toward sustainable forestry is mixed • The world is still losing forested land - But advances are being made toward sustainable forestry © 2011 Pearson Education, Inc. 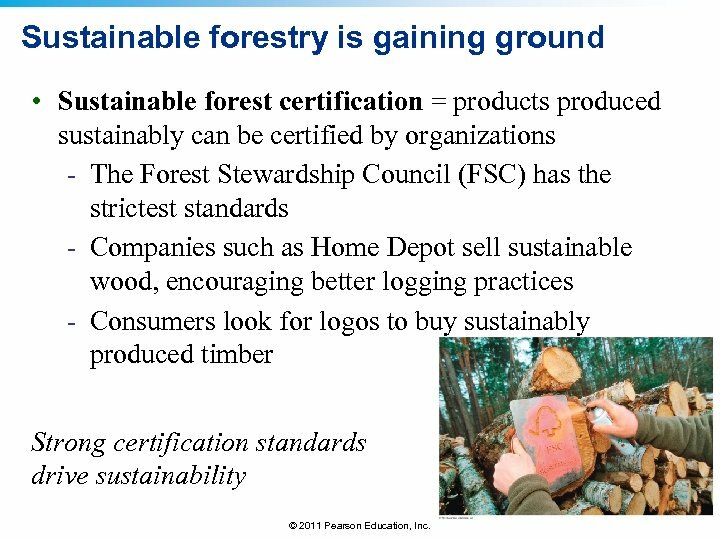 Sustainable forestry is gaining ground • Sustainable forest certification = products produced sustainably can be certified by organizations - The Forest Stewardship Council (FSC) has the strictest standards - Companies such as Home Depot sell sustainable wood, encouraging better logging practices - Consumers look for logos to buy sustainably produced timber Strong certification standards drive sustainability © 2011 Pearson Education, Inc.
Why create parks and reserves? 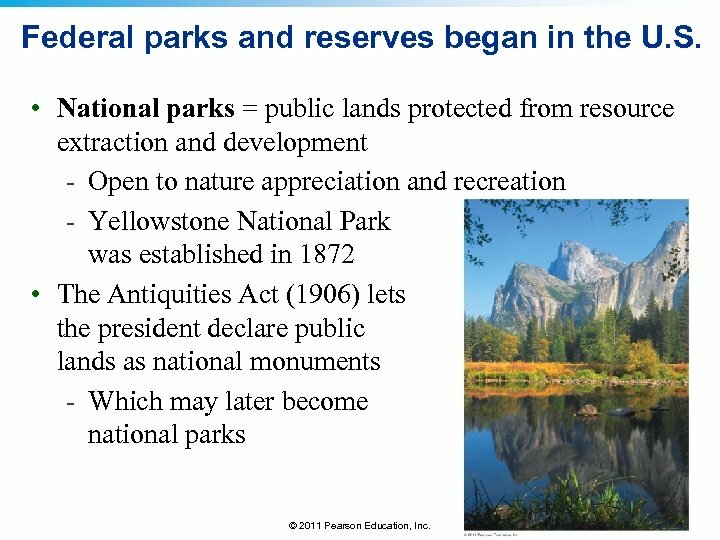 • People establish parks and reserves to: - Preserve areas with enormous or unusual scenic features, such as the Grand Canyon - Offer recreational value: hiking, fishing, hunting, etc. 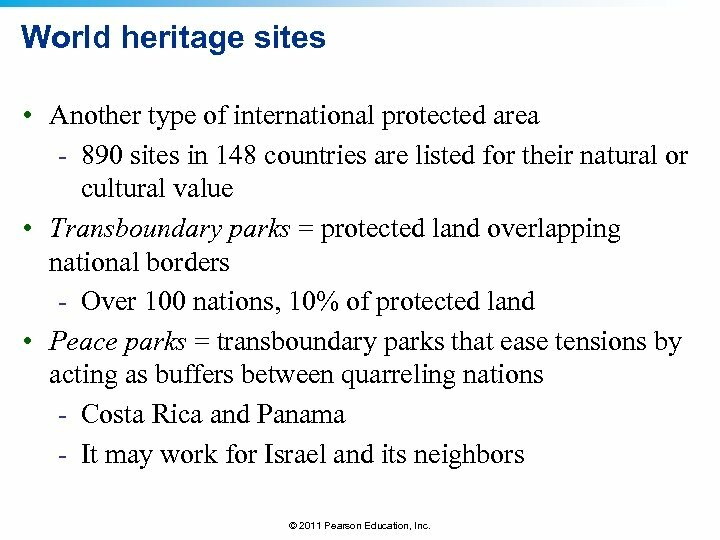 - Generate revenue from ecotourism - Offer peace of mind, health, exploration, wonder, etc. 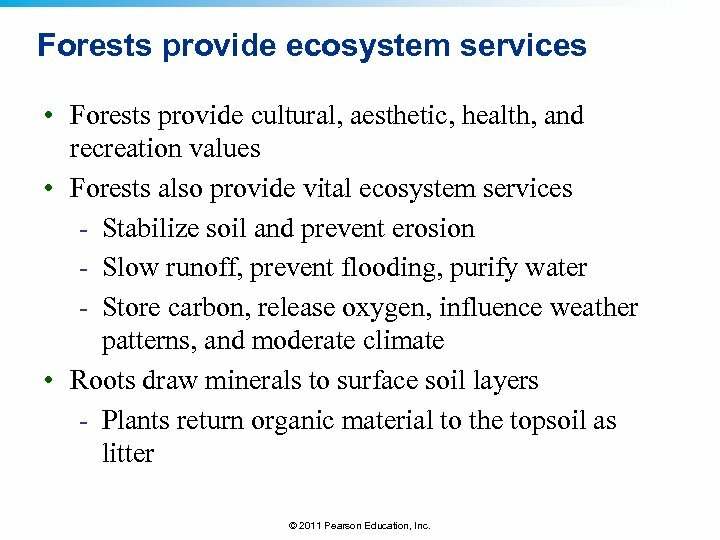 - Protect areas that provide ecosystem services - Use sites that are otherwise economically not valuable and are therefore easy to protect - Preserve biodiversity © 2011 Pearson Education, Inc.
Federal parks and reserves began in the U. S. • National parks = public lands protected from resource extraction and development - Open to nature appreciation and recreation - Yellowstone National Park was established in 1872 • The Antiquities Act (1906) lets the president declare public lands as national monuments - Which may later become national parks © 2011 Pearson Education, Inc. 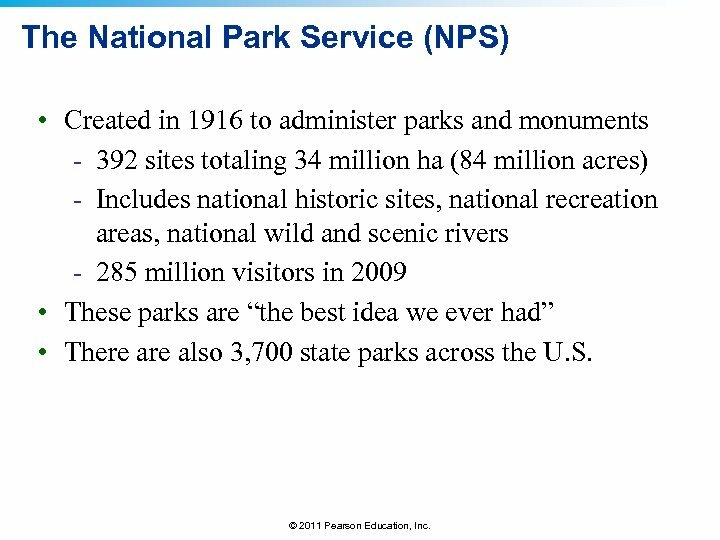 The National Park Service (NPS) • Created in 1916 to administer parks and monuments - 392 sites totaling 34 million ha (84 million acres) - Includes national historic sites, national recreation areas, national wild and scenic rivers - 285 million visitors in 2009 • These parks are “the best idea we ever had” • There also 3, 700 state parks across the U. S. © 2011 Pearson Education, Inc.
National Wildlife Refuges • Begun in 1903 by President Theodore Roosevelt - 39 million ha (96 million acres) in 550 sites - The Pacific Remote Islands Marine National Monument added 22 million ha (55 million acres) • U. S. Fish and Wildlife Service (USFWS) - Administers wildlife refuges, serving as havens - But allows hunting, fishing, wildlife observation, photography, education - Managed for waterfowl and non-game species - Restores marshes and grasslands © 2011 Pearson Education, Inc.
Wilderness areas are on federal lands Wilderness areas = are off-limits to development • For hiking, nature study, etc. 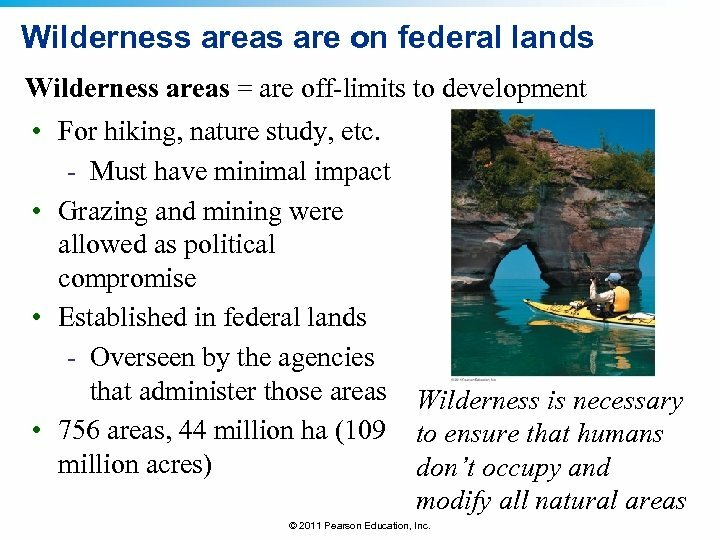 - Must have minimal impact • Grazing and mining were allowed as political compromise • Established in federal lands - Overseen by the agencies that administer those areas Wilderness is necessary • 756 areas, 44 million ha (109 to ensure that humans million acres) don’t occupy and modify all natural areas © 2011 Pearson Education, Inc.
Not everyone supports land set-asides • Some western states want resource extraction and development • The wise-use movement = individuals and industries opposed to environmental protection want: - To protect private property, oppose government regulation - Federal lands transferred to state or private hands - Motorized recreation on public lands - Farmers, ranchers, loggers, mineral, and fossil fuel industries © 2011 Pearson Education, Inc.
Opposition to wilderness protection • President George W. Bush weakened wilderness protection - Federal agencies shifted policies and enforcement away from preservation and conservation toward recreation and resource extraction • Indigenous people often oppose land protection - Recreational areas are often sacred to Native cultures • But protected areas can help indigenous people - In Brazil and other Latin American nations, these areas protect tribes from miners, farmers, and settlers © 2011 Pearson Education, Inc.
Nonfederal entities also protect land • Each U. S. state has agencies that manage resources on public lands - So do counties and municipalities • Land trusts = local or regional organizations that purchase land to protect it - The Nature Conservancy is the world’s largest land trust - Trusts own 690, 000 ha (1. 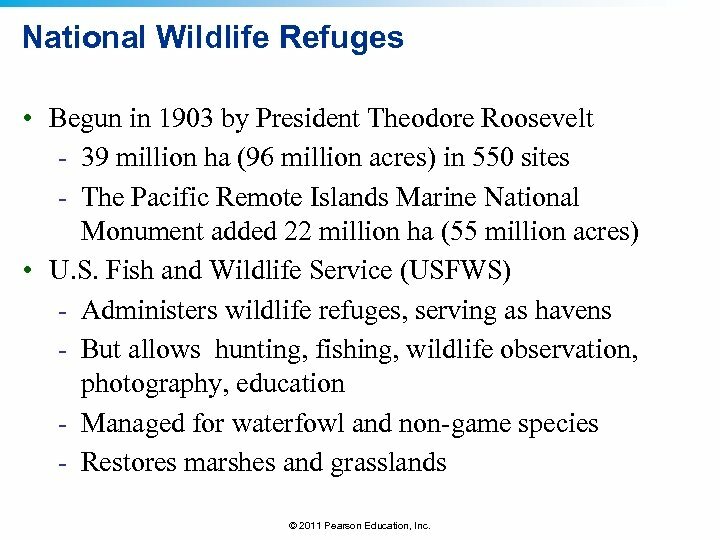 7 million acres) and protect an additional 4. 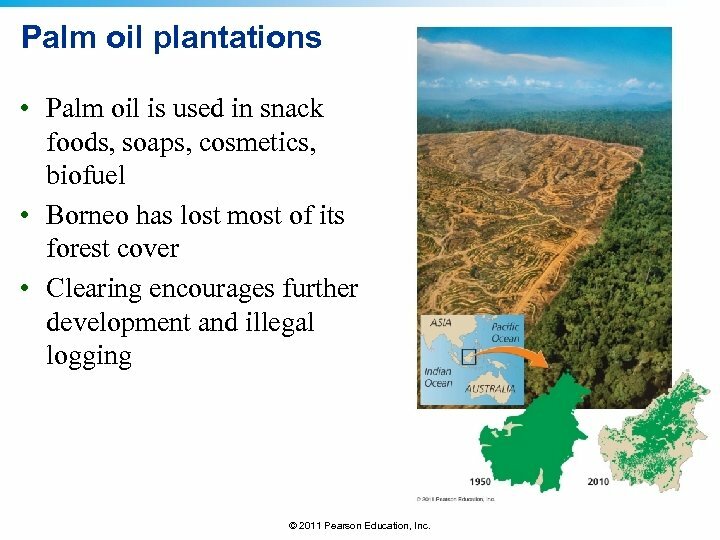 1 million ha (10. 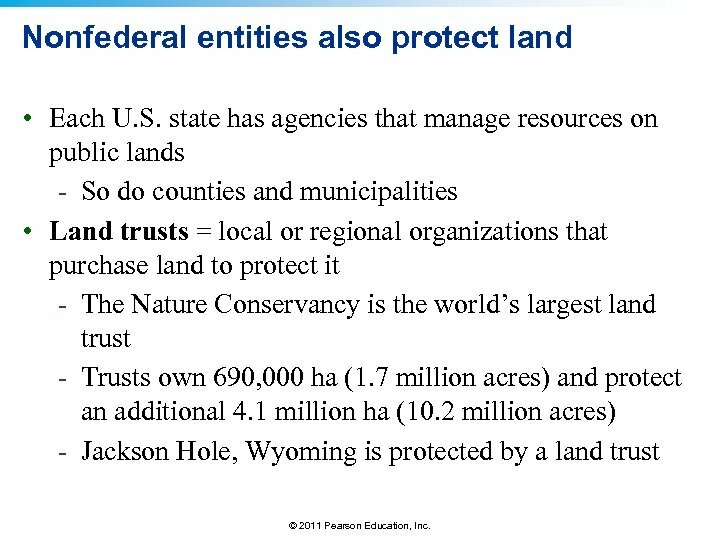 2 million acres) - Jackson Hole, Wyoming is protected by a land trust © 2011 Pearson Education, Inc. 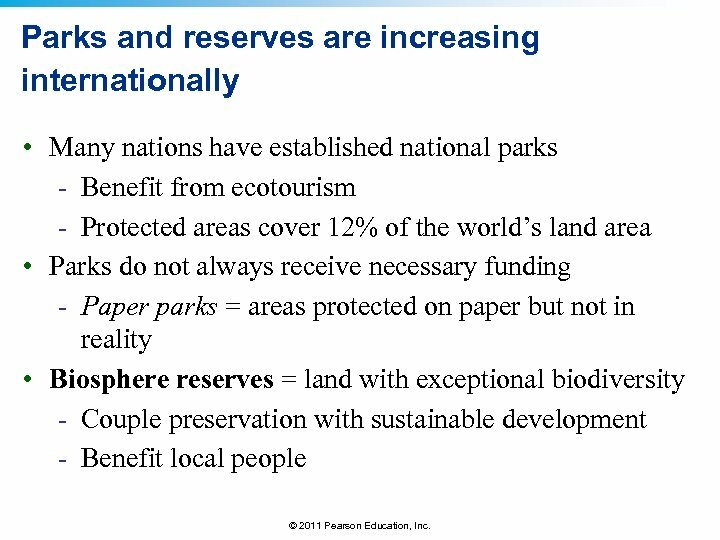 Parks and reserves are increasing internationally • Many nations have established national parks - Benefit from ecotourism - Protected areas cover 12% of the world’s land area • Parks do not always receive necessary funding - Paper parks = areas protected on paper but not in reality • Biosphere reserves = land with exceptional biodiversity - Couple preservation with sustainable development - Benefit local people © 2011 Pearson Education, Inc.
Biosphere reserves have several zones • Are designated by UNESCO (the UN Educational, Scientific, and Cultural Organization) © 2011 Pearson Education, Inc.
World heritage sites • Another type of international protected area - 890 sites in 148 countries are listed for their natural or cultural value • Transboundary parks = protected land overlapping national borders - Over 100 nations, 10% of protected land • Peace parks = transboundary parks that ease tensions by acting as buffers between quarreling nations - Costa Rica and Panama - It may work for Israel and its neighbors © 2011 Pearson Education, Inc.
Habitat fragmentation makes preserves vital • Contiguous habitat is chopped into small pieces - Species suffer © 2011 Pearson Education, Inc. 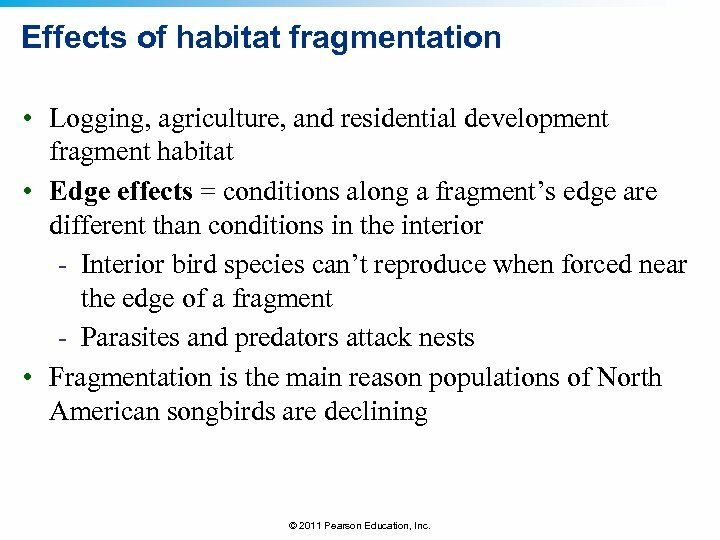 Effects of habitat fragmentation • Logging, agriculture, and residential development fragment habitat • Edge effects = conditions along a fragment’s edge are different than conditions in the interior - Interior bird species can’t reproduce when forced near the edge of a fragment - Parasites and predators attack nests • Fragmentation is the main reason populations of North American songbirds are declining © 2011 Pearson Education, Inc.
Islands warn us of habitat fragmentation • Island biogeography theory = explains how species come to be distributed among oceanic islands - It also applies to “habitat islands” = patches of one habitat within “seas” of others • The number of island species results from a balance between species added (immigration) versus lost (extirpation) - Predicted by the island’s size and distance from the mainland • Area effect = large islands have more species than small - They have more habitats, environments, and variety © 2011 Pearson Education, Inc. 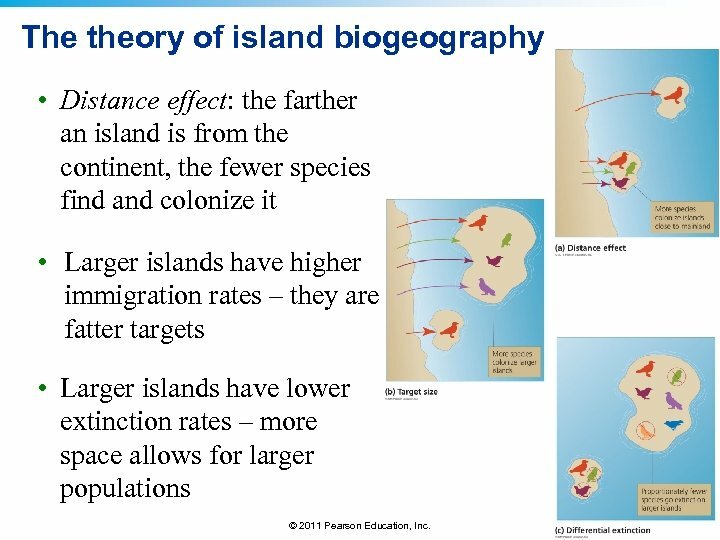 The theory of island biogeography • Distance effect: the farther an island is from the continent, the fewer species find and colonize it • Larger islands have higher immigration rates – they are fatter targets • Larger islands have lower extinction rates – more space allows for larger populations © 2011 Pearson Education, Inc. 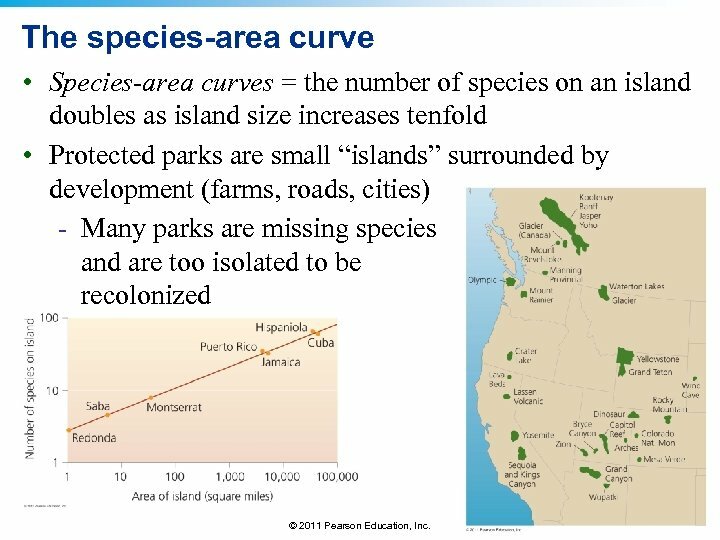 The species-area curve • Species-area curves = the number of species on an island doubles as island size increases tenfold • Protected parks are small “islands” surrounded by development (farms, roads, cities) - Many parks are missing species and are too isolated to be recolonized © 2011 Pearson Education, Inc.
Reserve design has consequences • With habitat fragmentation, the size and placement of protected areas are key to protecting biodiversity • The SLOSS dilemma = which is better to protect species: a single large or several small reserves? 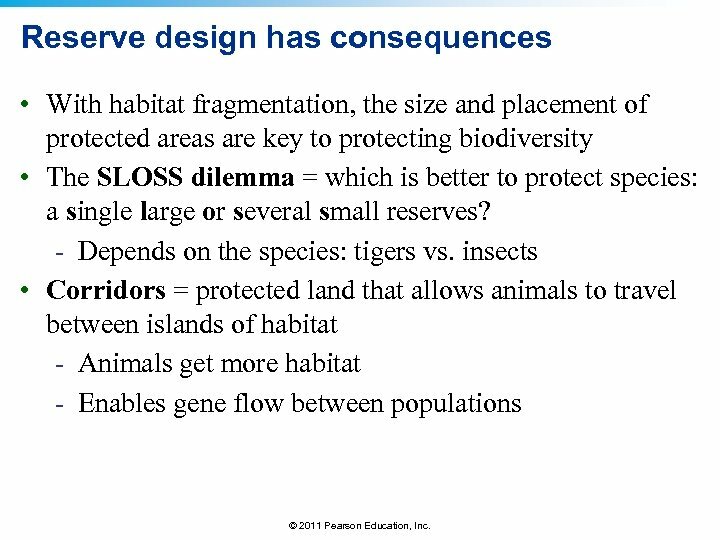 - Depends on the species: tigers vs. insects • Corridors = protected land that allows animals to travel between islands of habitat - Animals get more habitat - Enables gene flow between populations © 2011 Pearson Education, Inc. 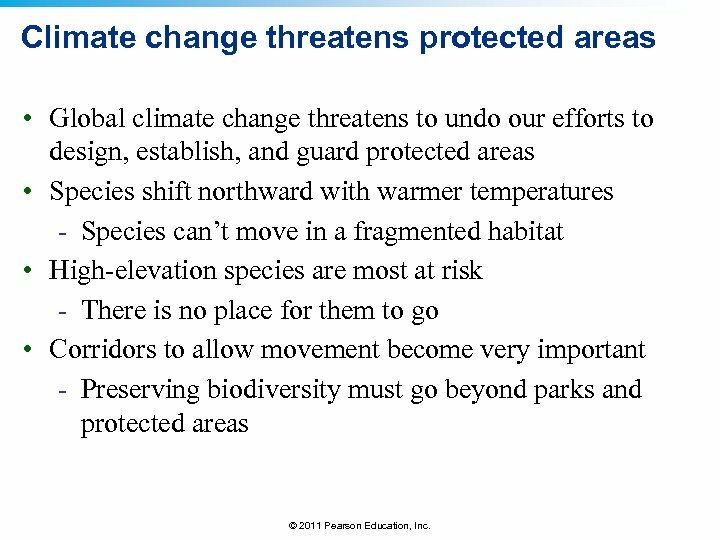 Climate change threatens protected areas • Global climate change threatens to undo our efforts to design, establish, and guard protected areas • Species shift northward with warmer temperatures - Species can’t move in a fragmented habitat • High-elevation species are most at risk - There is no place for them to go • Corridors to allow movement become very important - Preserving biodiversity must go beyond parks and protected areas © 2011 Pearson Education, Inc. 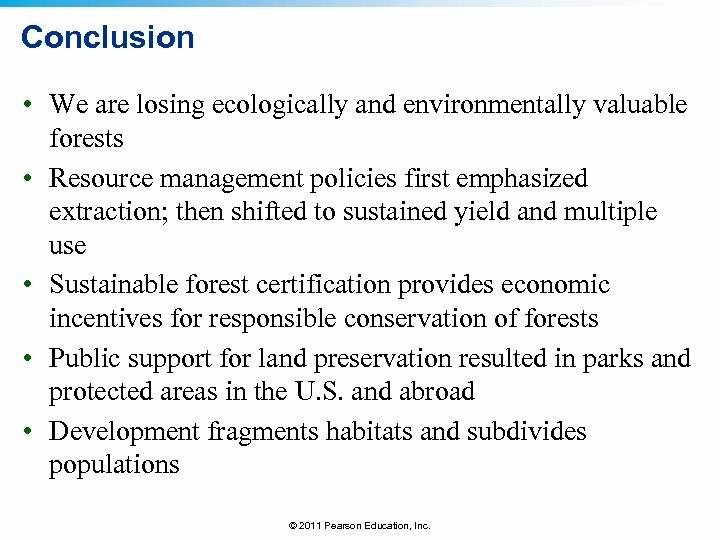 Conclusion • We are losing ecologically and environmentally valuable forests • Resource management policies first emphasized extraction; then shifted to sustained yield and multiple use • Sustainable forest certification provides economic incentives for responsible conservation of forests • Public support for land preservation resulted in parks and protected areas in the U. S. and abroad • Development fragments habitats and subdivides populations © 2011 Pearson Education, Inc. 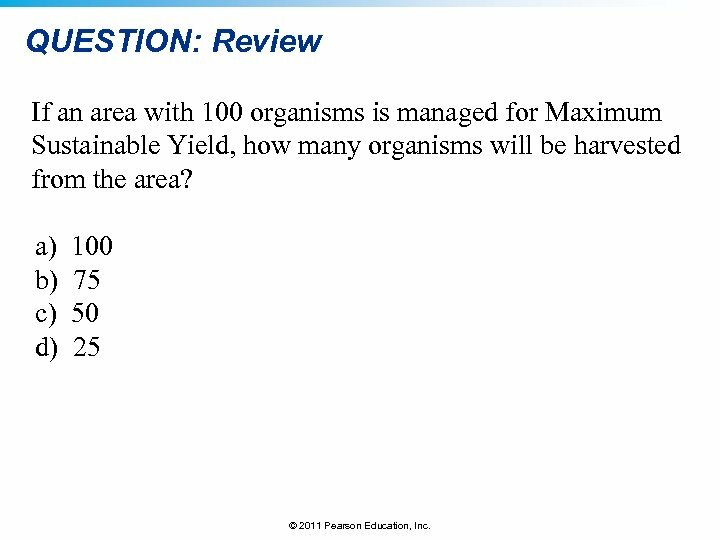 QUESTION: Review If an area with 100 organisms is managed for Maximum Sustainable Yield, how many organisms will be harvested from the area? 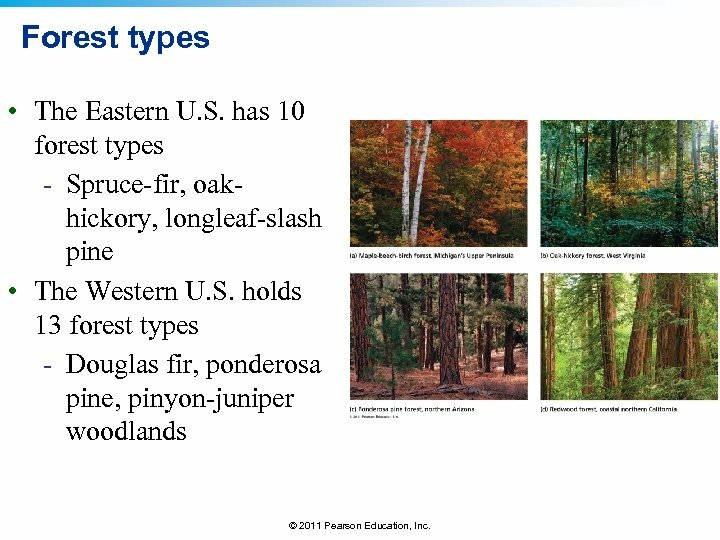 a) b) c) d) 100 75 50 25 © 2011 Pearson Education, Inc. 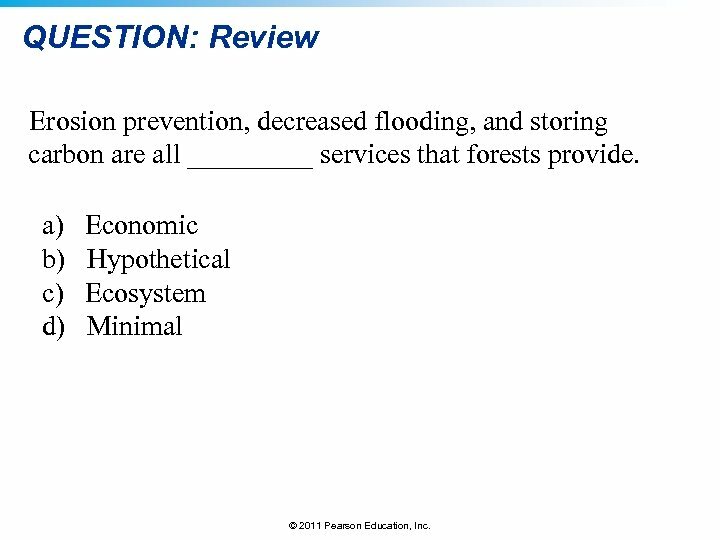 QUESTION: Review Erosion prevention, decreased flooding, and storing carbon are all _____ services that forests provide. 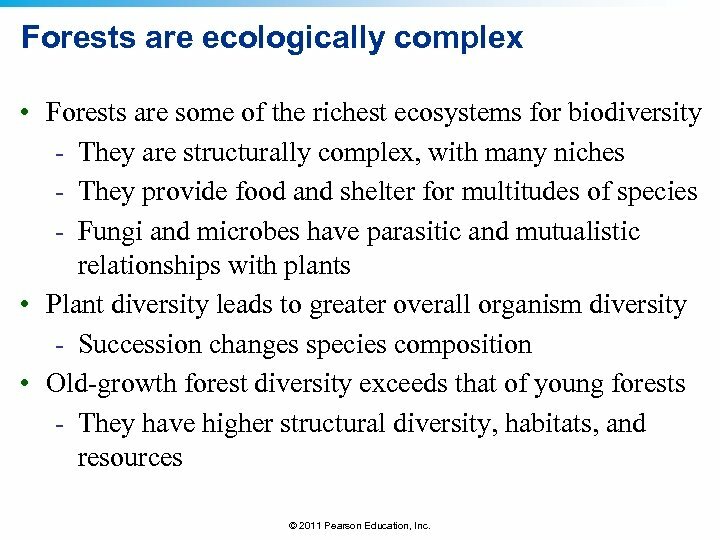 a) b) c) d) Economic Hypothetical Ecosystem Minimal © 2011 Pearson Education, Inc. 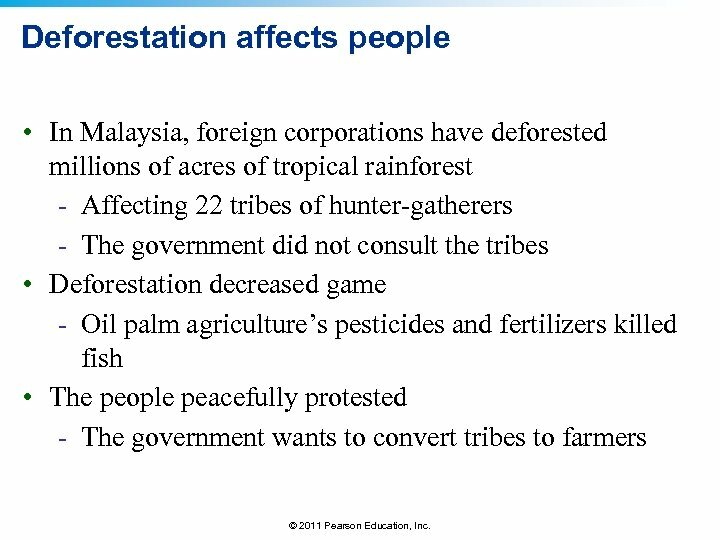 QUESTION: Review Which of the following is NOT a result of deforestation? 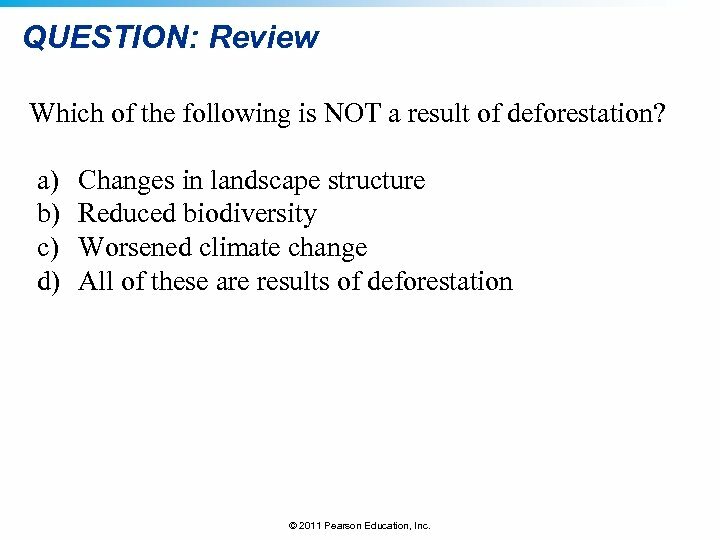 a) b) c) d) Changes in landscape structure Reduced biodiversity Worsened climate change All of these are results of deforestation © 2011 Pearson Education, Inc. 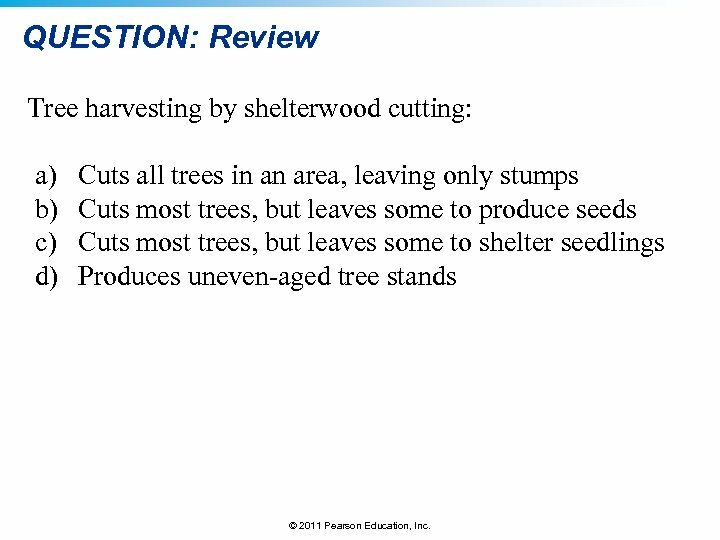 QUESTION: Review Tree harvesting by shelterwood cutting: a) b) c) d) Cuts all trees in an area, leaving only stumps Cuts most trees, but leaves some to produce seeds Cuts most trees, but leaves some to shelter seedlings Produces uneven-aged tree stands © 2011 Pearson Education, Inc. 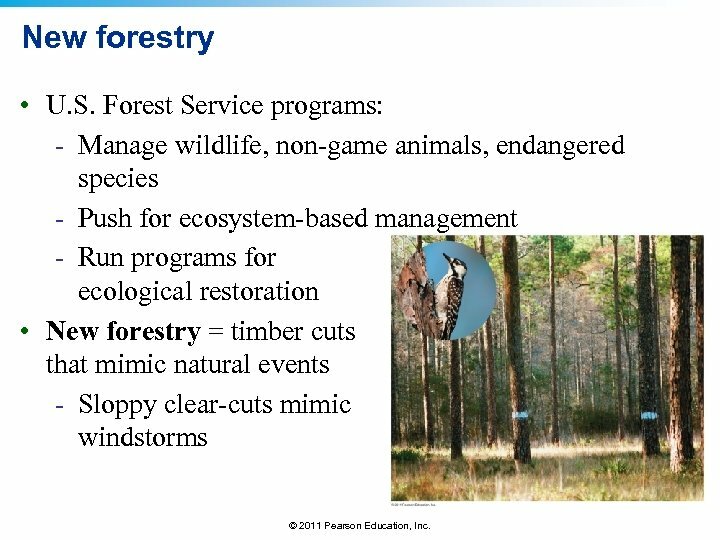 QUESTION: Review Which agency manages wilderness? 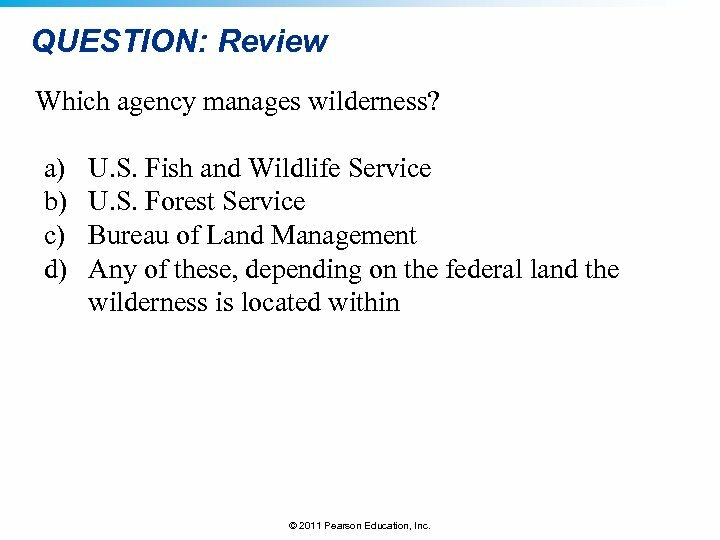 a) b) c) d) U. S. Fish and Wildlife Service U. S. Forest Service Bureau of Land Management Any of these, depending on the federal land the wilderness is located within © 2011 Pearson Education, Inc. 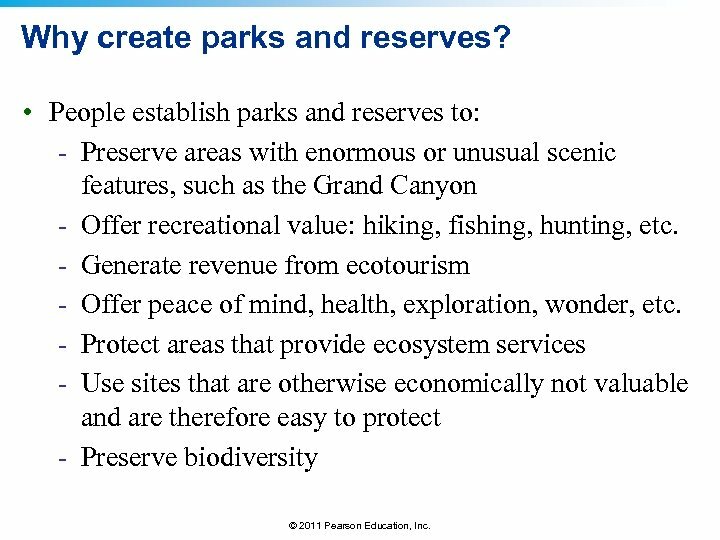 QUESTION: Review People create parks and reserves for many reasons. 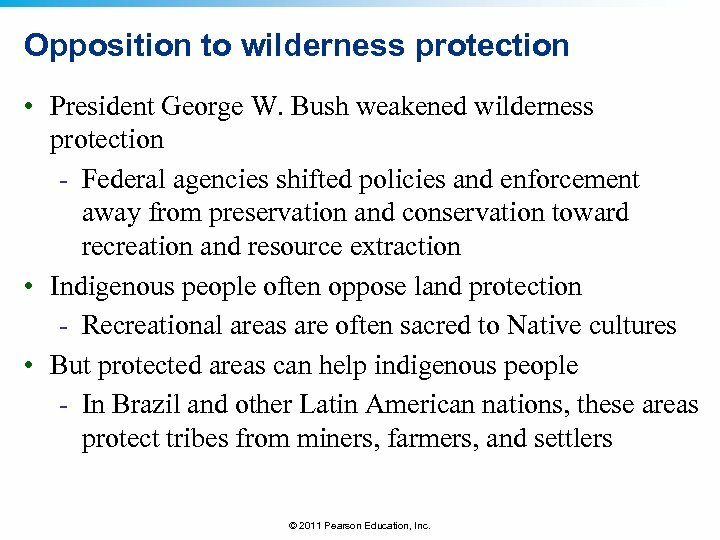 Which of the following is NOT a reason to protect land? 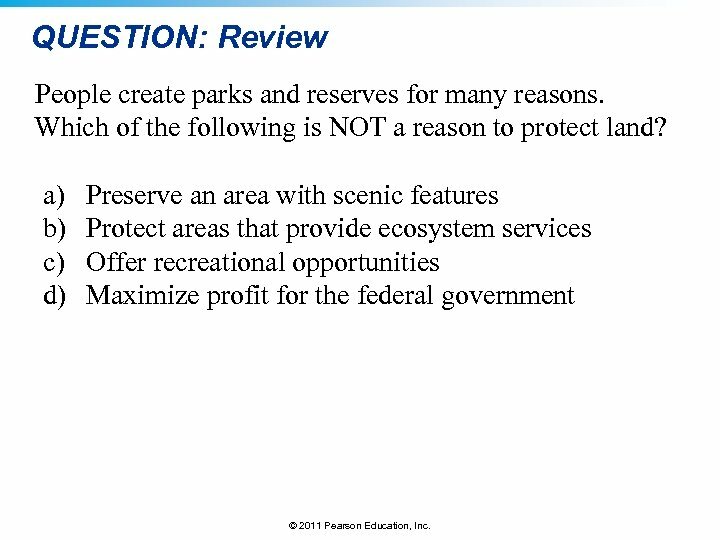 a) b) c) d) Preserve an area with scenic features Protect areas that provide ecosystem services Offer recreational opportunities Maximize profit for the federal government © 2011 Pearson Education, Inc. 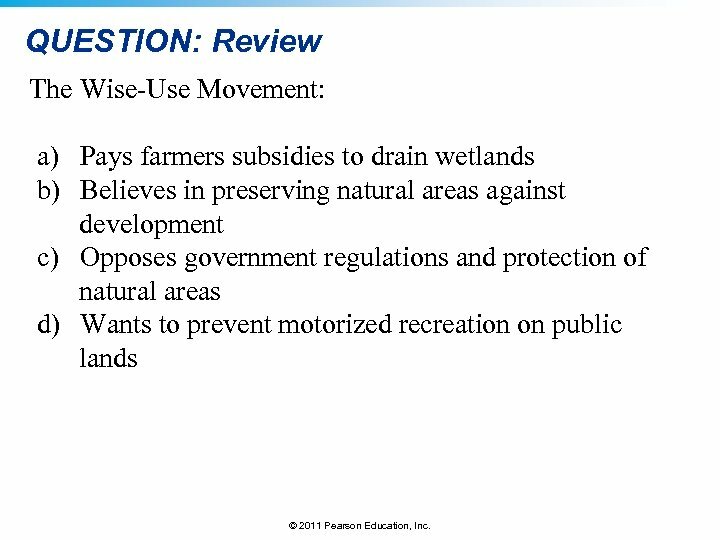 QUESTION: Review The Wise-Use Movement: a) Pays farmers subsidies to drain wetlands b) Believes in preserving natural areas against development c) Opposes government regulations and protection of natural areas d) Wants to prevent motorized recreation on public lands © 2011 Pearson Education, Inc. 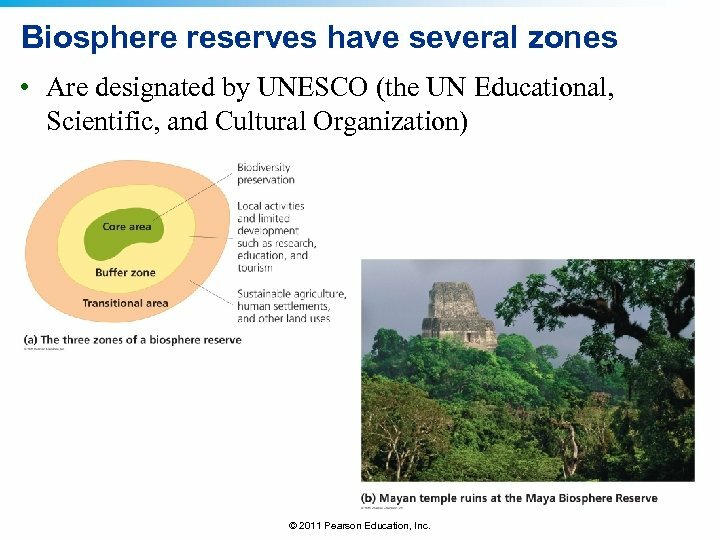 QUESTION: Review Biosphere reserves are: a) b) c) d) Very large areas Areas with exceptional biodiversity Heavily developed Completely protected from all development © 2011 Pearson Education, Inc. 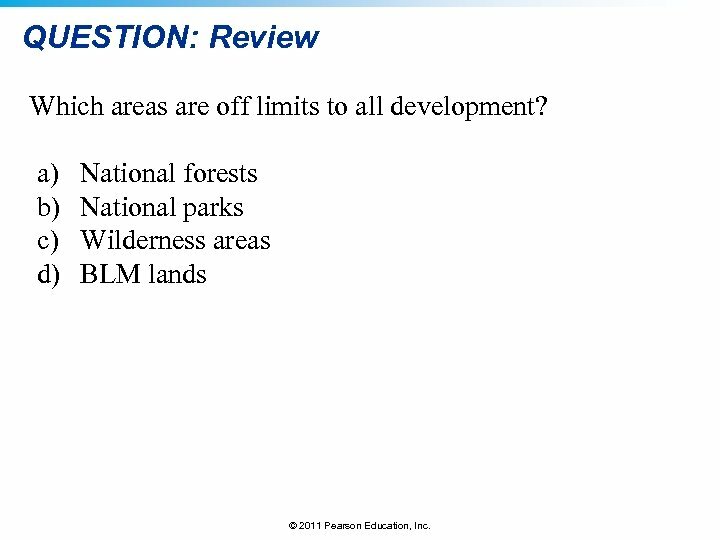 QUESTION: Review Which areas are off limits to all development? 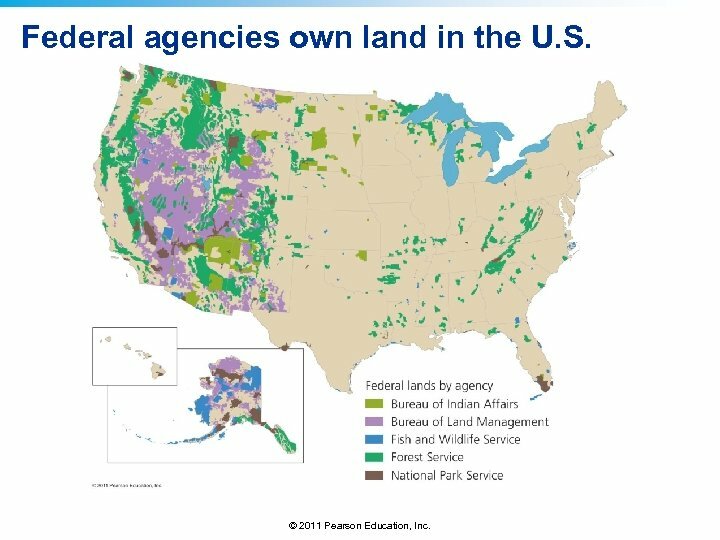 a) b) c) d) National forests National parks Wilderness areas BLM lands © 2011 Pearson Education, Inc. 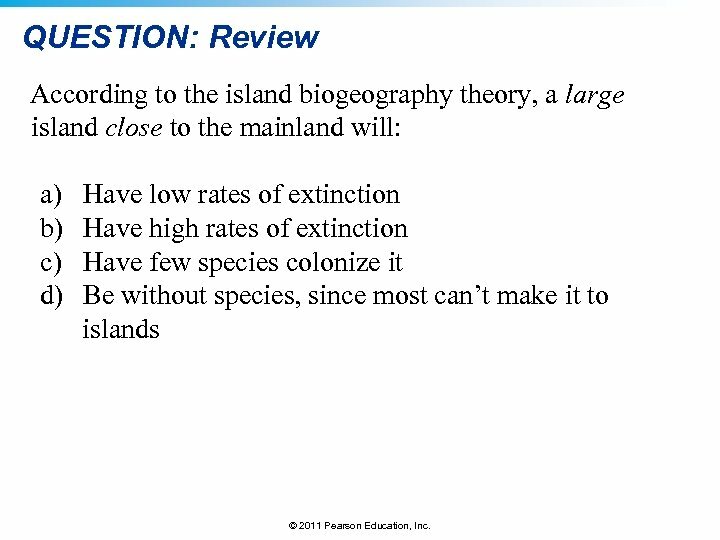 QUESTION: Review According to the island biogeography theory, a large island close to the mainland will: a) b) c) d) Have low rates of extinction Have high rates of extinction Have few species colonize it Be without species, since most can’t make it to islands © 2011 Pearson Education, Inc. 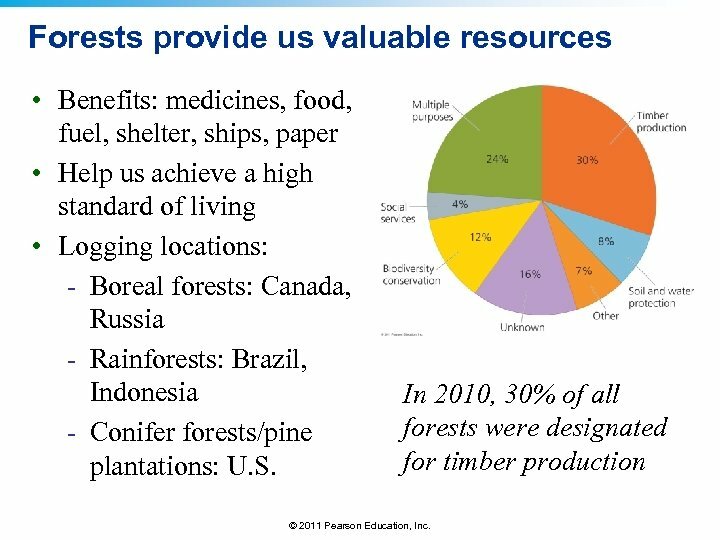 QUESTION: Viewpoints Some states manage their natural resources (i. e. , forests) based strictly on profit maximization. 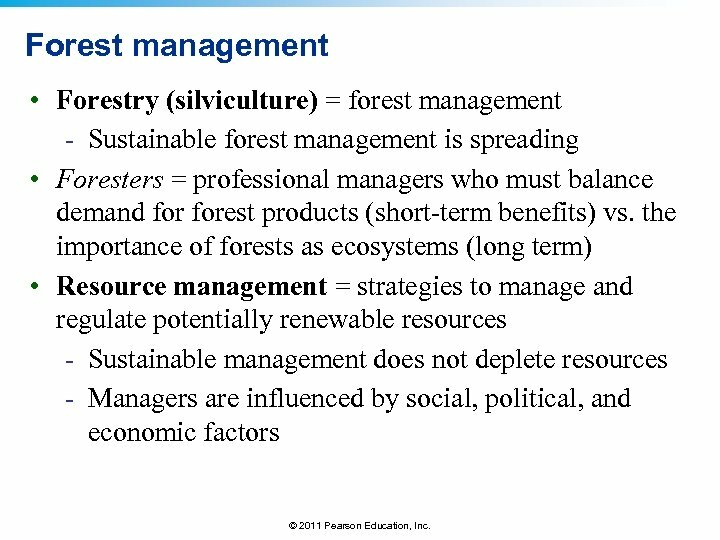 Is this the best way to manage natural resources? 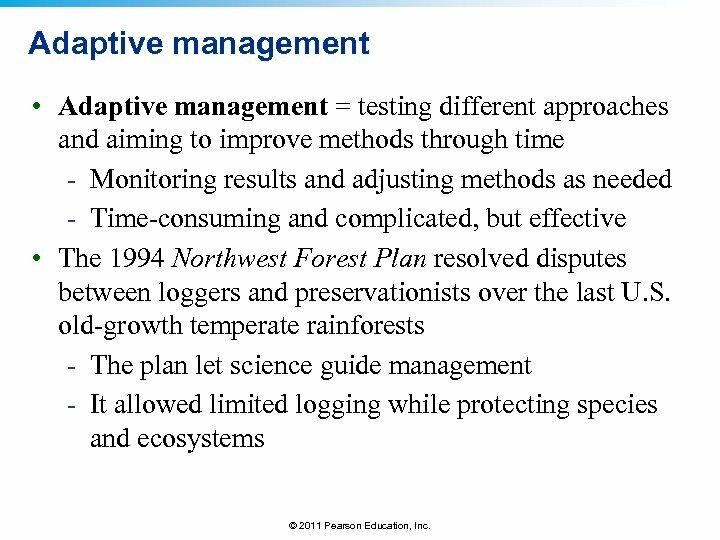 a) Yes, anytime profit can be made, that should be the type of management used. 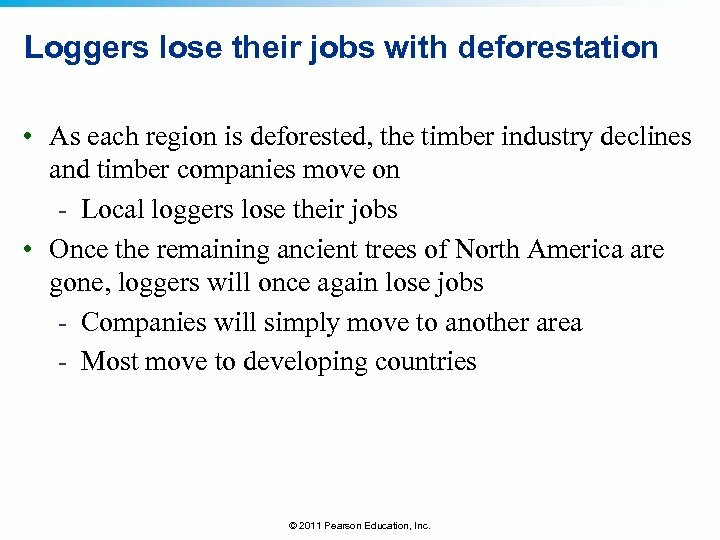 b) Yes, but only if more jobs are created than lost. 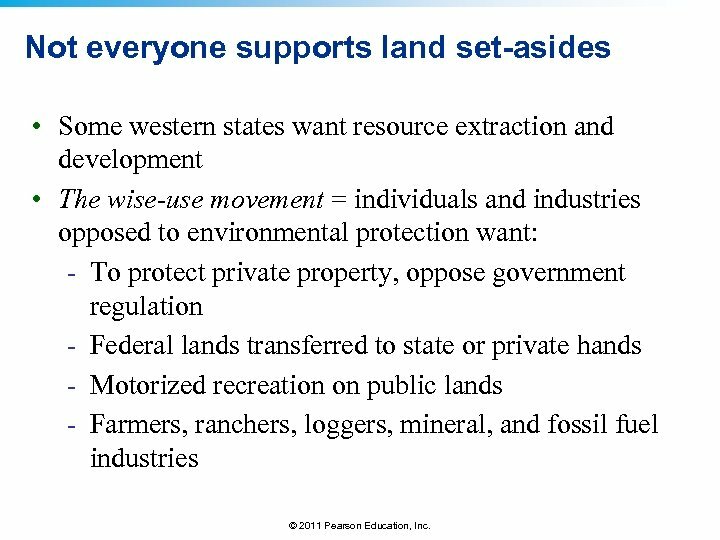 c) No, natural resources are far more important than their economic value suggests. 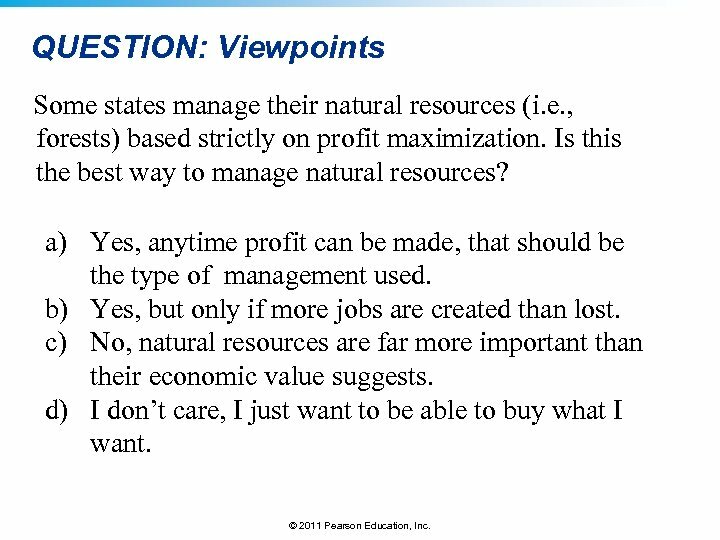 d) I don’t care, I just want to be able to buy what I want. 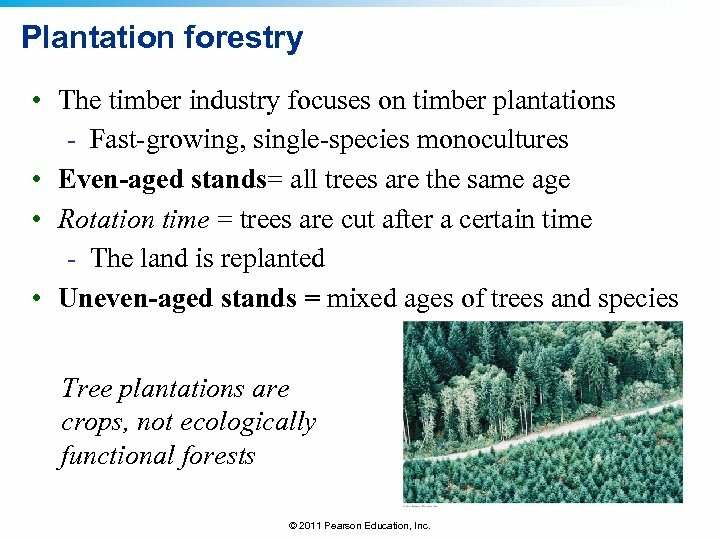 © 2011 Pearson Education, Inc. 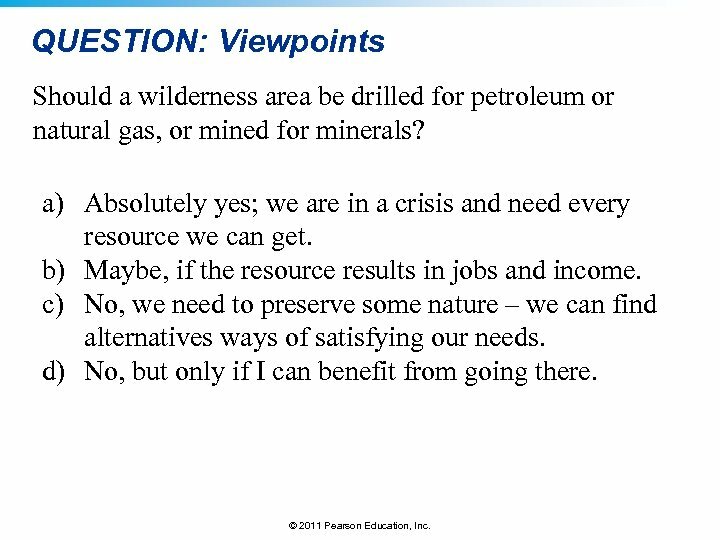 QUESTION: Viewpoints Should a wilderness area be drilled for petroleum or natural gas, or mined for minerals? 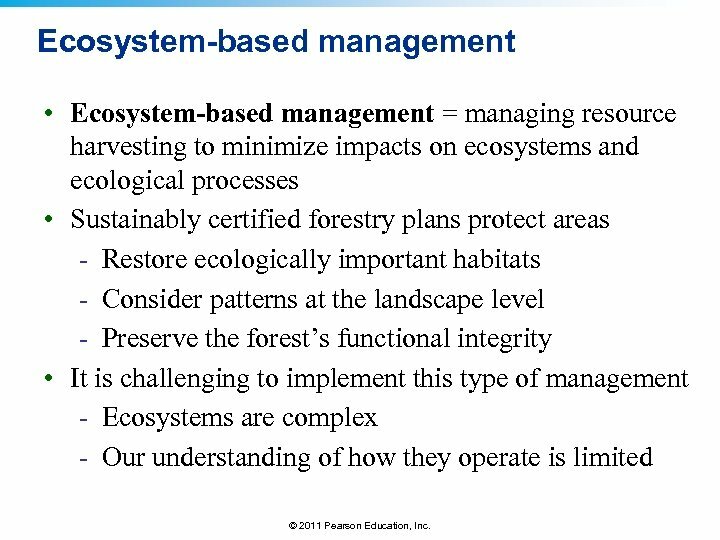 a) Absolutely yes; we are in a crisis and need every resource we can get. 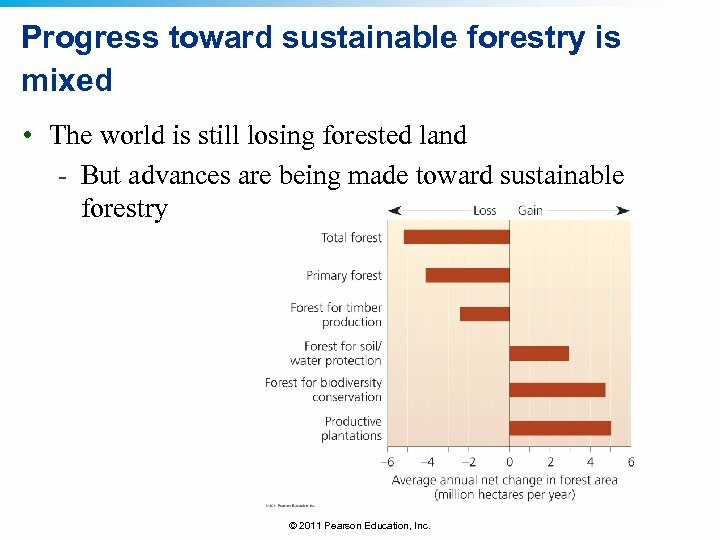 b) Maybe, if the resource results in jobs and income. 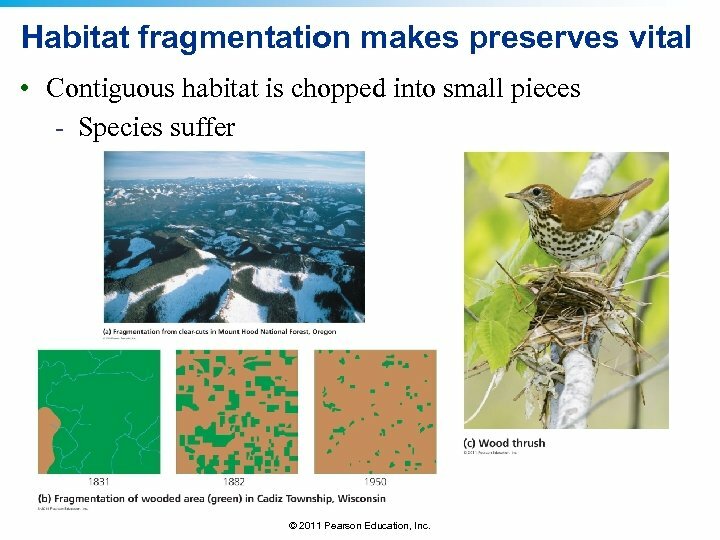 c) No, we need to preserve some nature – we can find alternatives ways of satisfying our needs. 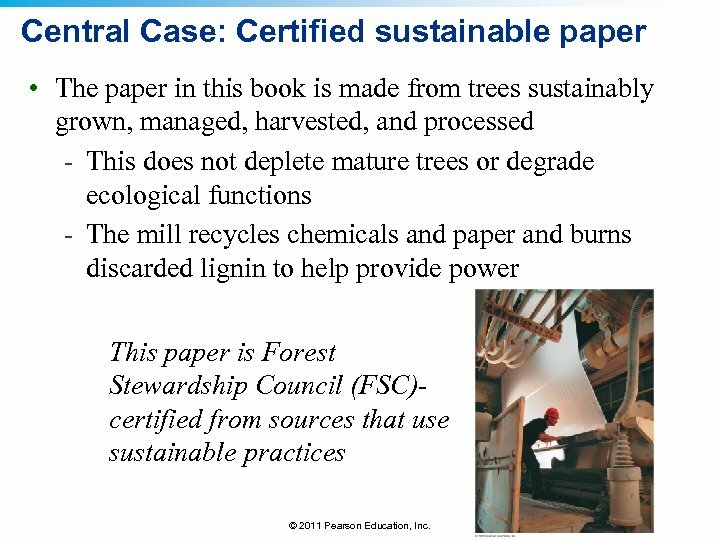 d) No, but only if I can benefit from going there. 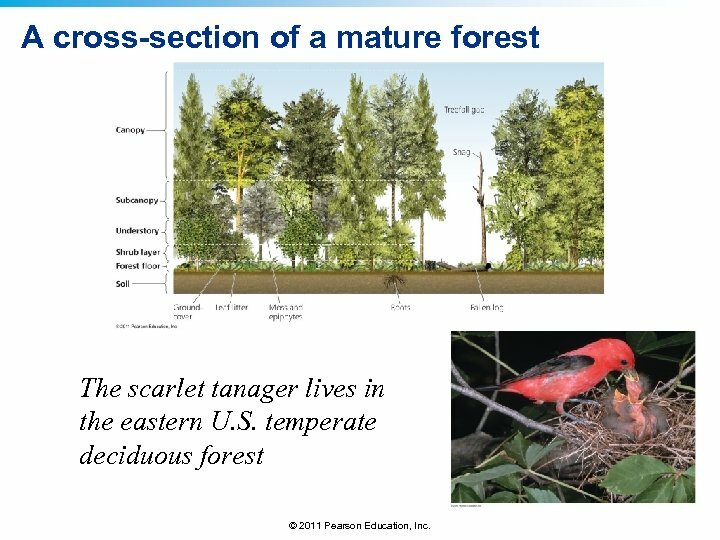 © 2011 Pearson Education, Inc. 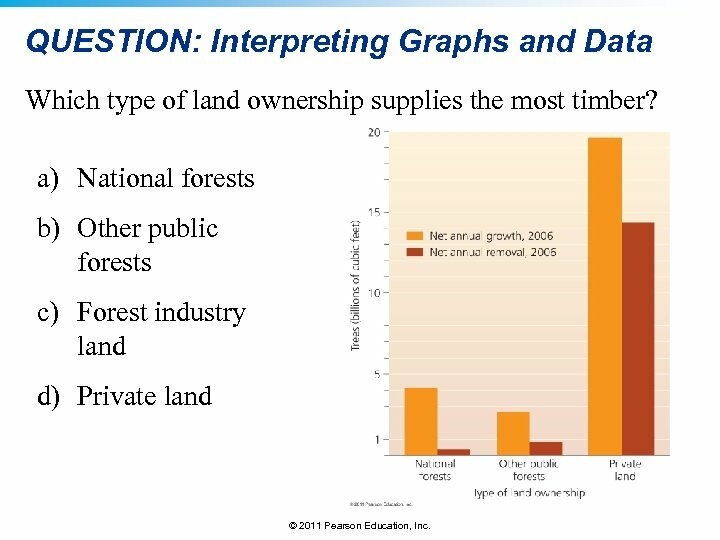 QUESTION: Interpreting Graphs and Data Which type of land ownership supplies the most timber? 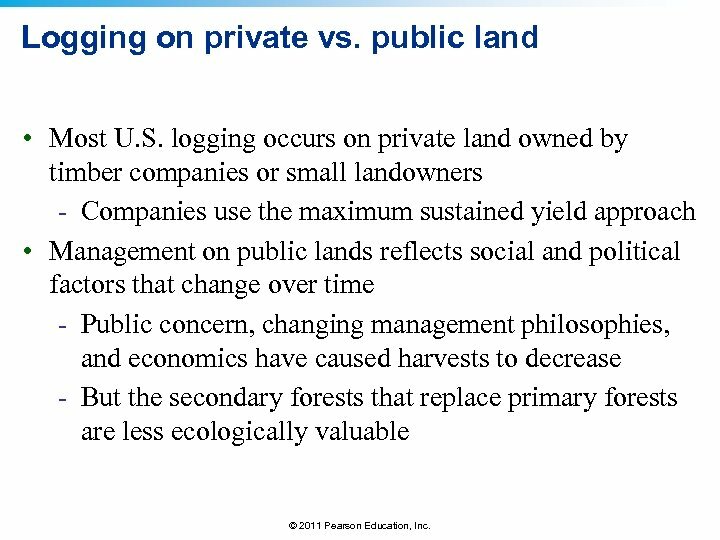 a) National forests b) Other public forests c) Forest industry land d) Private land © 2011 Pearson Education, Inc. 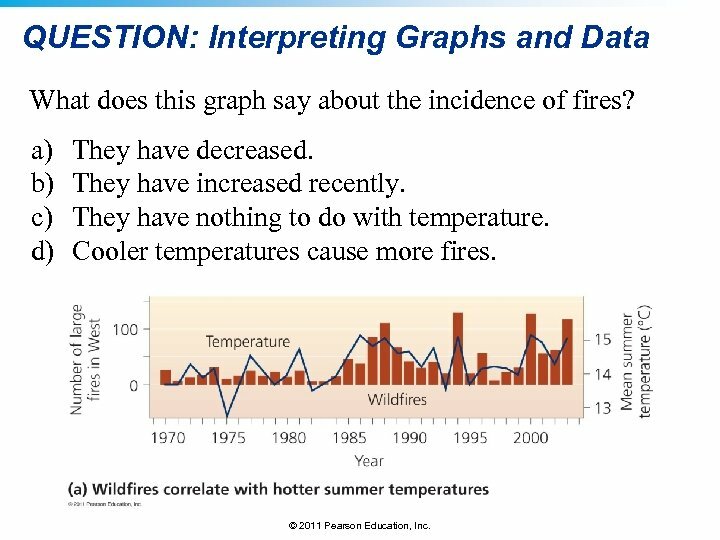 QUESTION: Interpreting Graphs and Data What does this graph say about the incidence of fires? 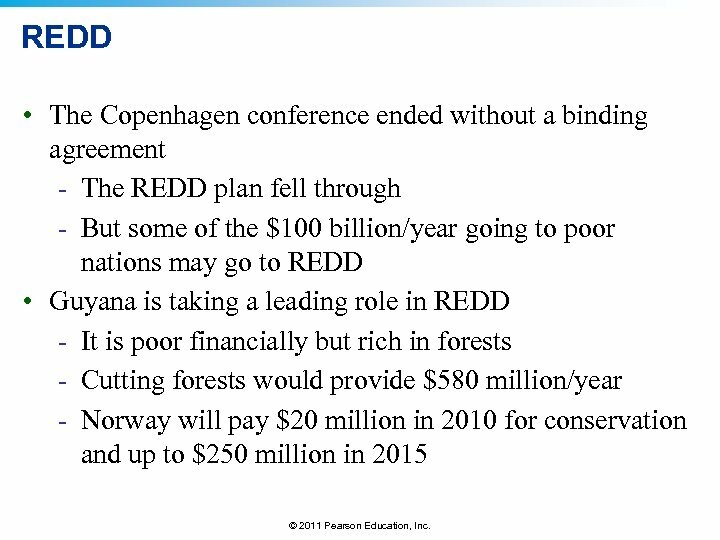 a) b) c) d) They have decreased. 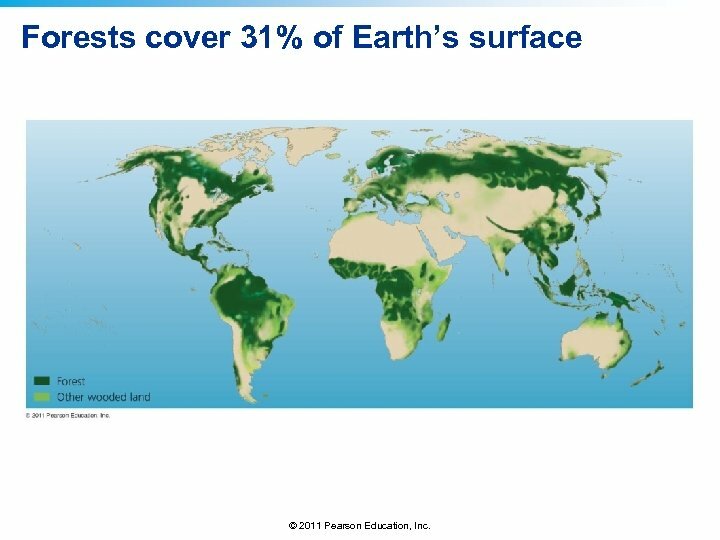 They have increased recently. 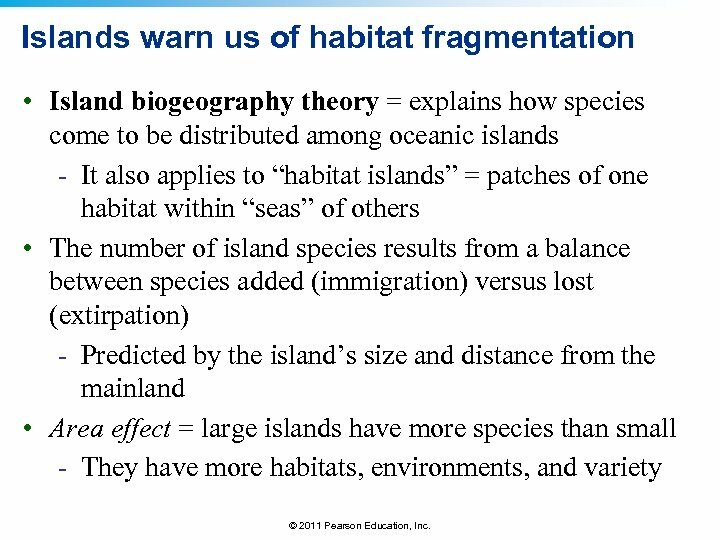 They have nothing to do with temperature. 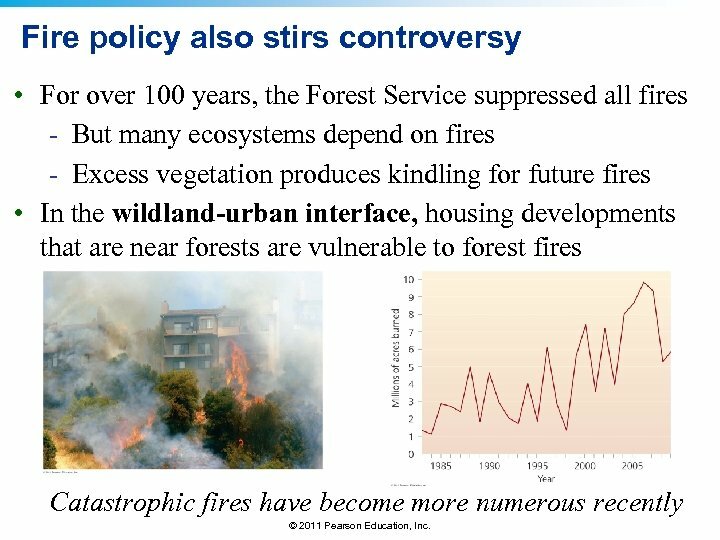 Cooler temperatures cause more fires. 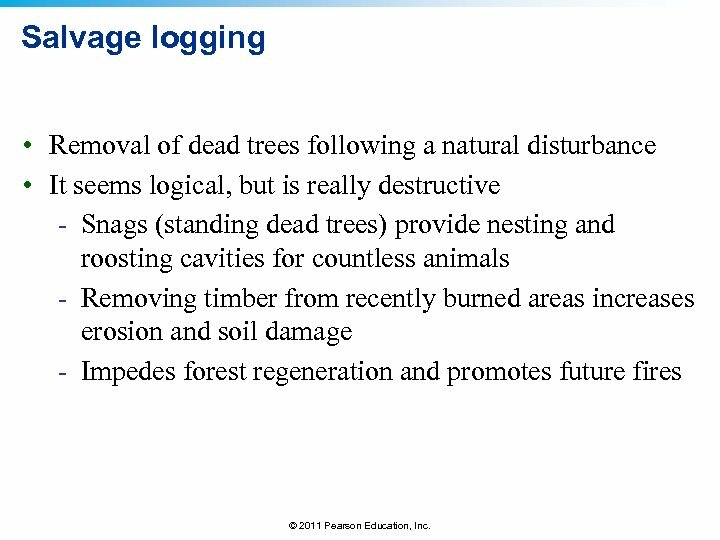 © 2011 Pearson Education, Inc.